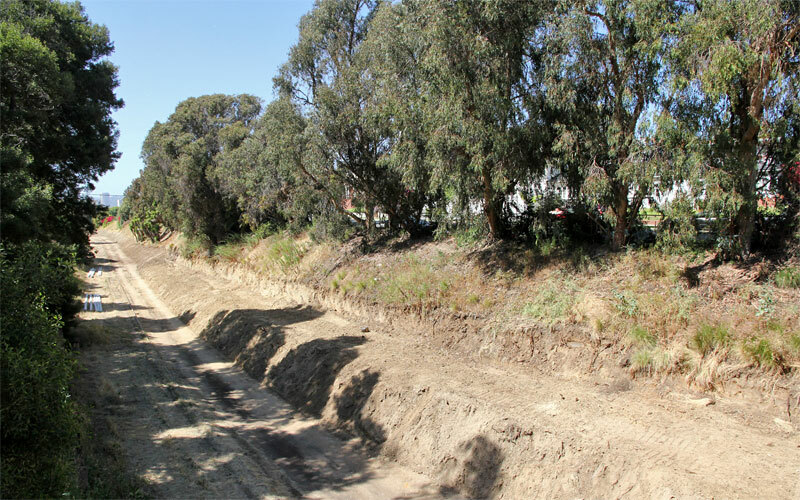 6/1/16 — Trains carrying passengers in the trench by Cheviot Hlls have come full circle from our historic Red Car photo at the bottom of this page! 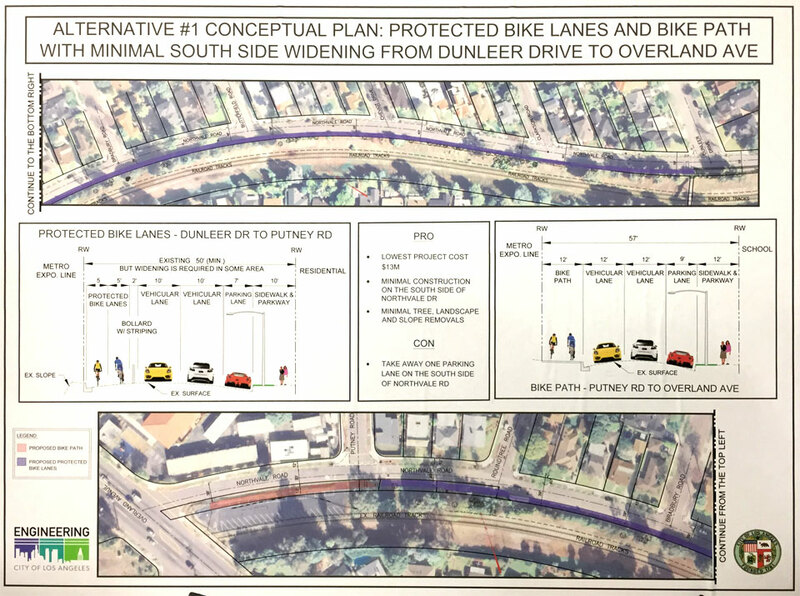 1/13/16 — At a public meeting today L.A. City presented an overall plan (above) and alternatives (#1 below) to close the bike path gap between Overland and Motor. 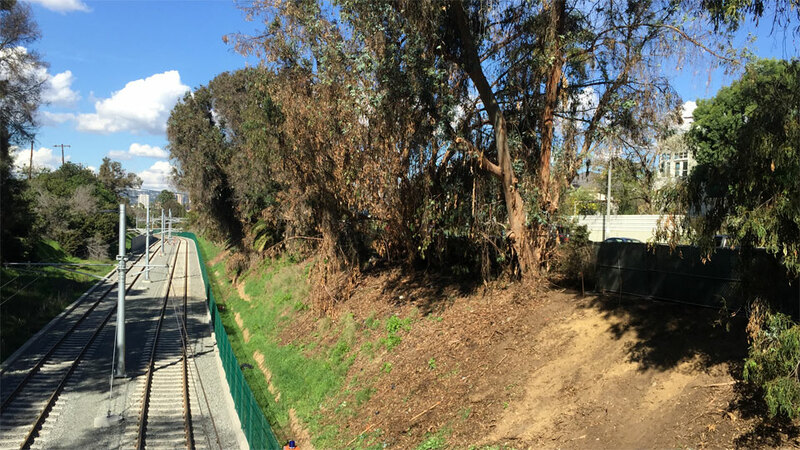 11/7/15 — A cyclist crosses Military from the newly-paved bike path (above), which continues to Overland (below, looking west). 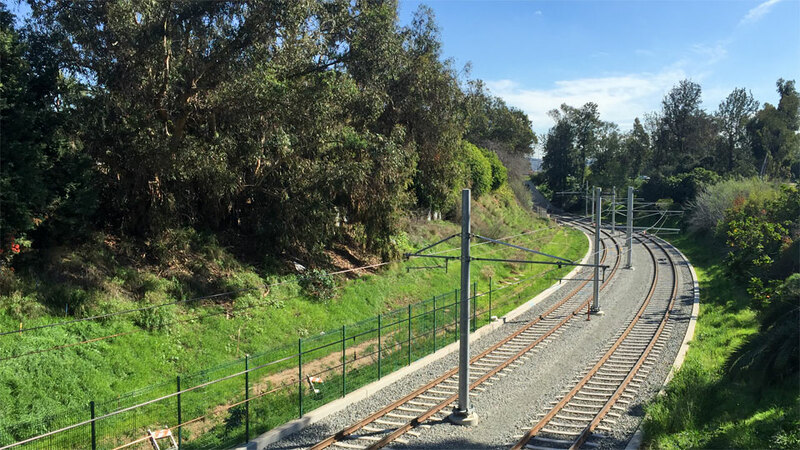 1/27/15 — Tracks, catenary, and fencing are complete, looking south (above) and north (below) from the Northvale pedestrian bridge on a beautiful early spring day. 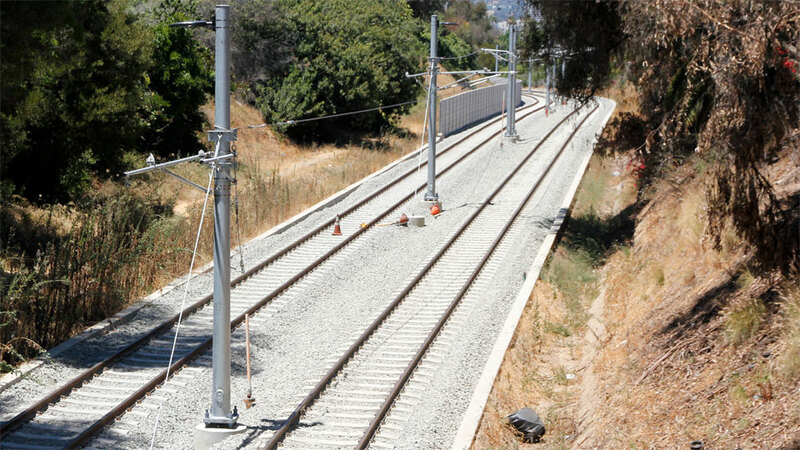 8/1/14 — The contact wire was added to complete this first catenary span across Overland Avenue! 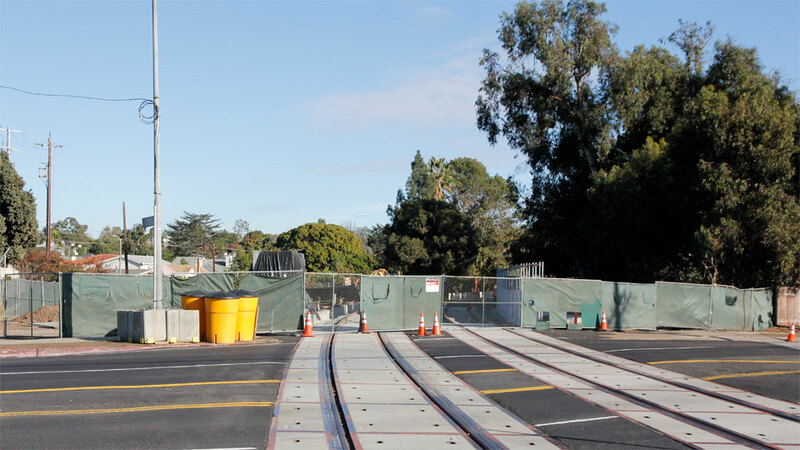 7/23/14 — The first phase 2 OCS wire span was just installed over both tracks, shining new copper from north of the pedestrian bridge (below) to across Overland Ave. (bottom). 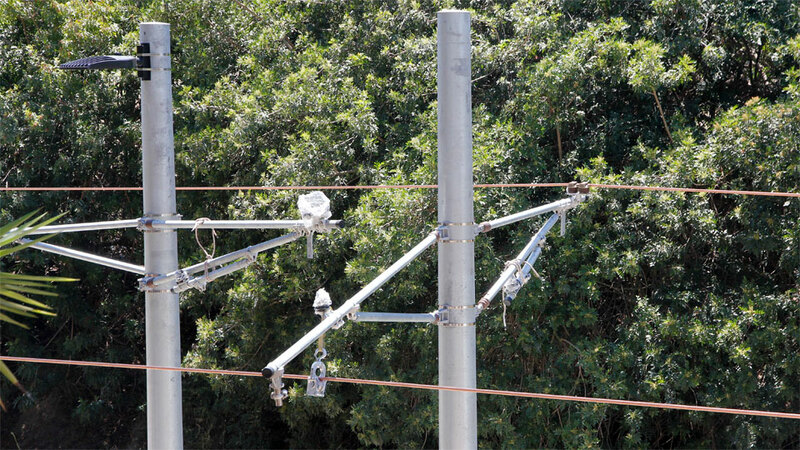 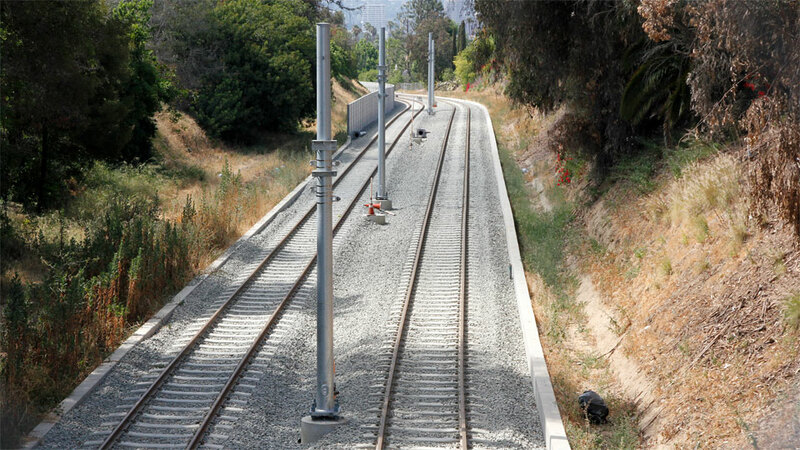 7/1/14 — Here are completed crossing gate mechanisms at Overland Avenue and cross-arms mounted on the catenary poles. 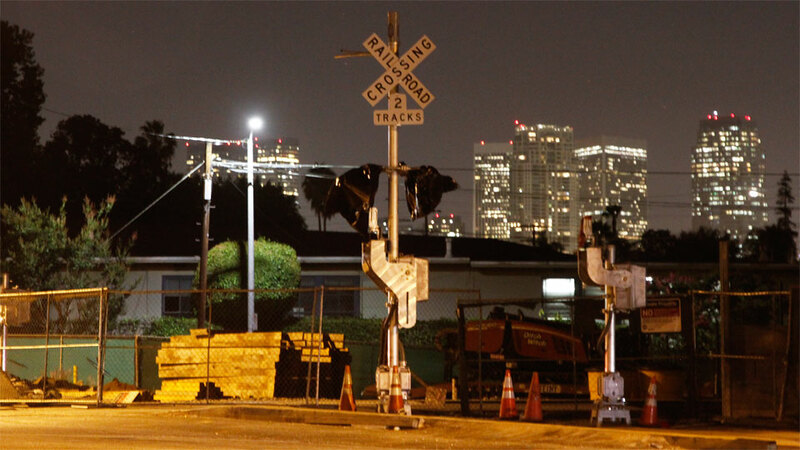 6/18/14 — The first crossing gate mechanisms are installed, on the east side of Overland (looking photogenic in front of the Century City skyline, above) and all four corners of Westwood. 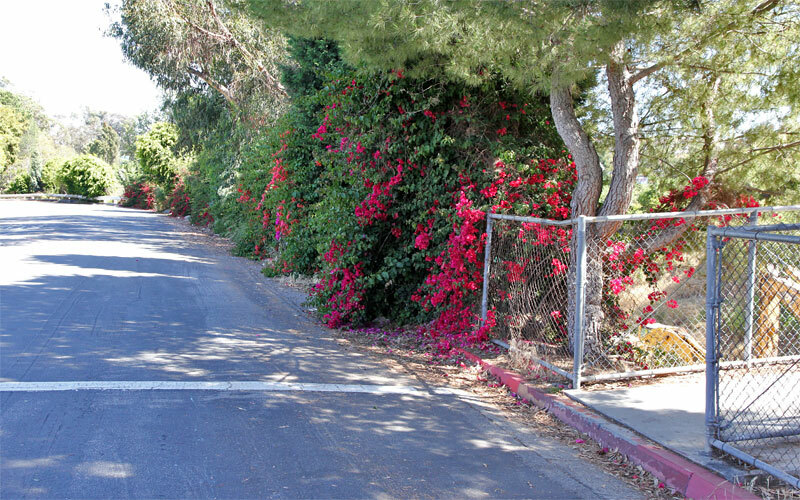 Note the pedestrian gate on the right. 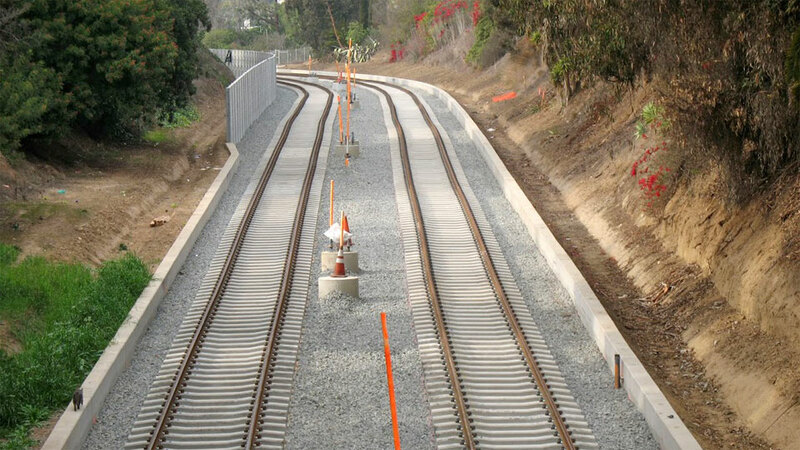 Construction of the crossing at Military is underway, with one track placed and some ties for the second (below). 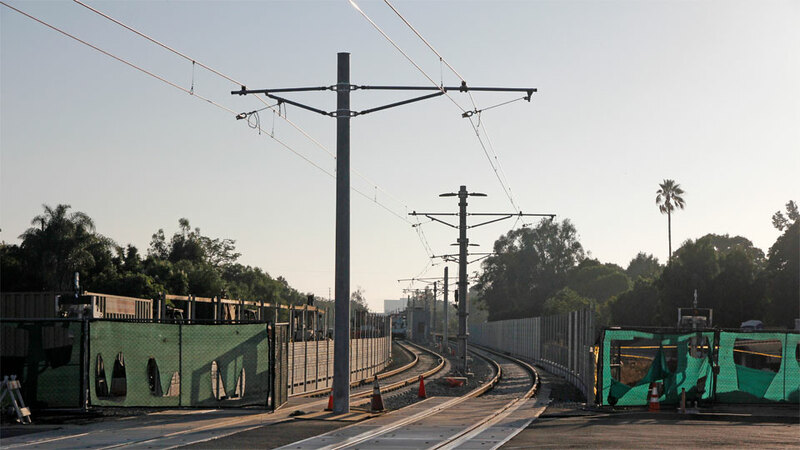 6/10/14 — Catenary poles are up to the tunnel under the freeway (east of Overland, above, and north and south of the pedestrian bridge, below). 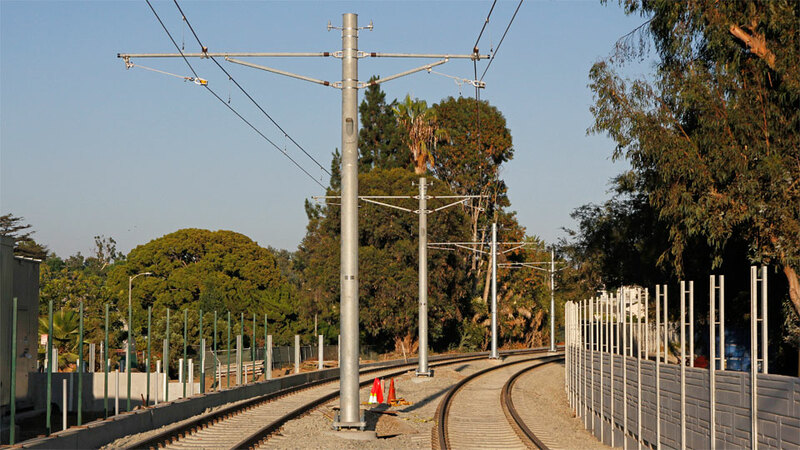 5/27/14 — The first catenary poles are up, east of Military! 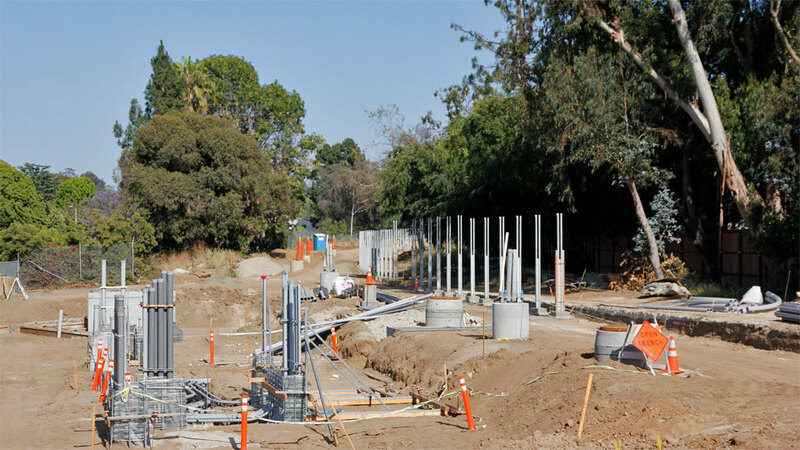 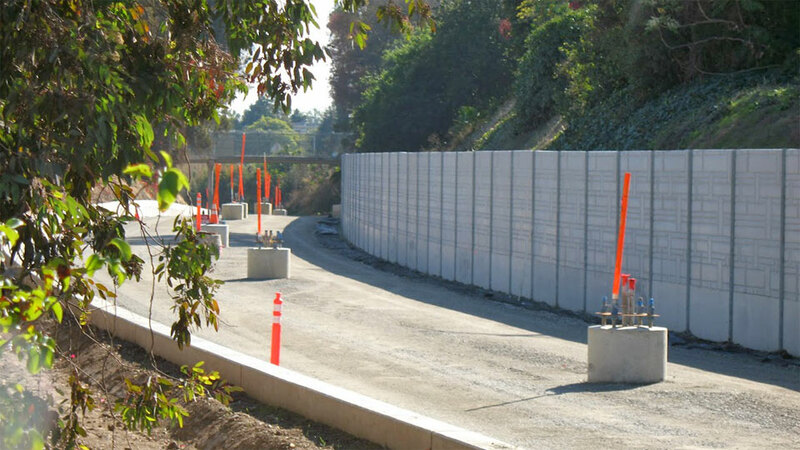 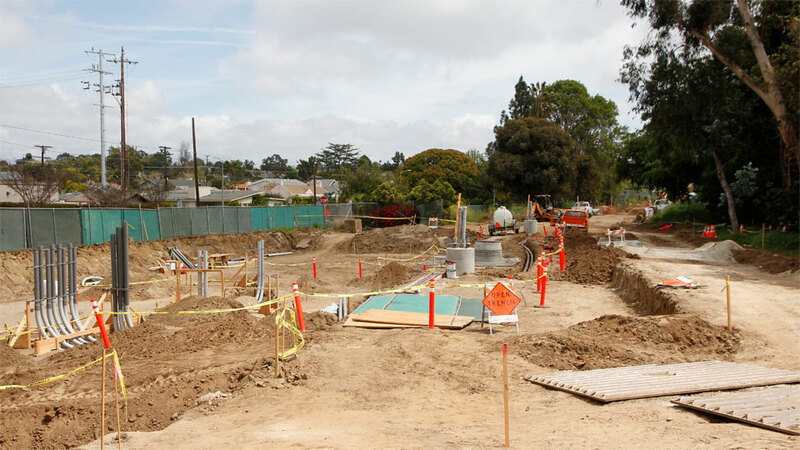 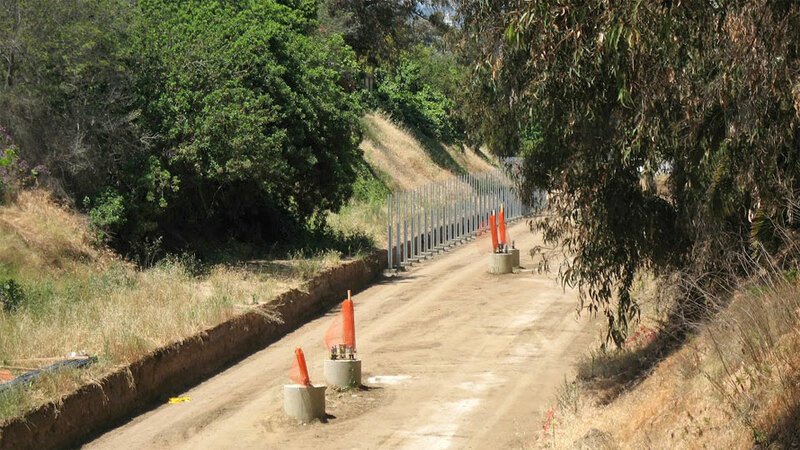 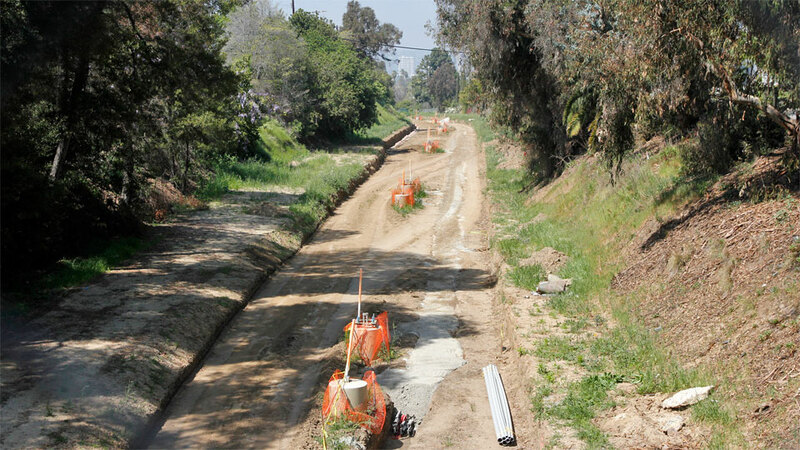 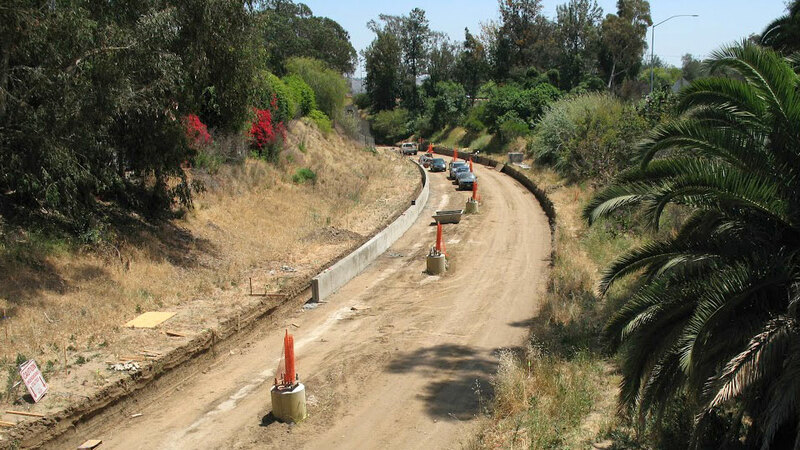 And the MSE walls are beginning for the last bridge embankment, east of Sepulveda (below). 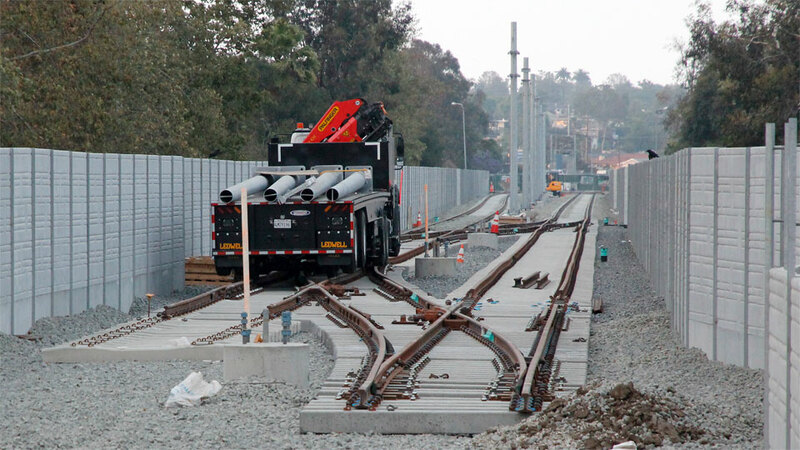 5/17/14 — Track and ballast are complete along Northvale. 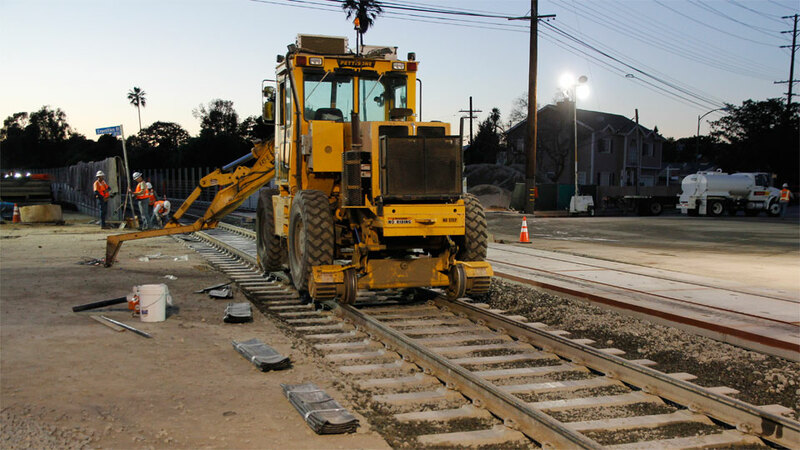 2/15/14 — Ties and rails are in place in the Northvale trench, with adjustment in the final layer of ballast yet to be done. 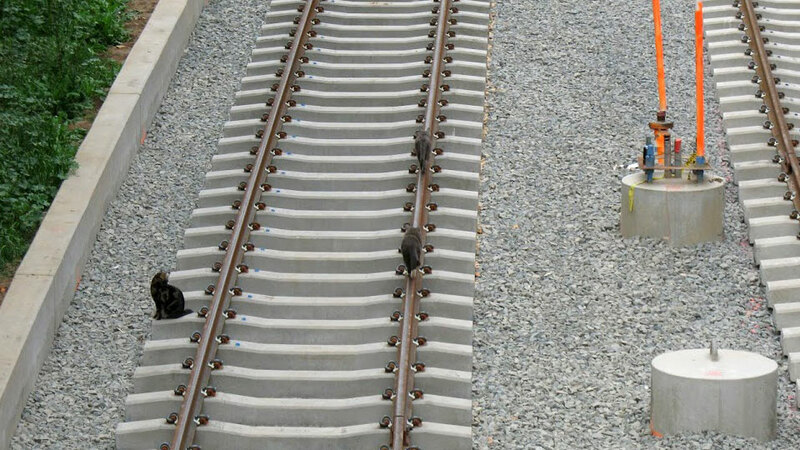 The feral cats seem to enjoy the new foot paths! 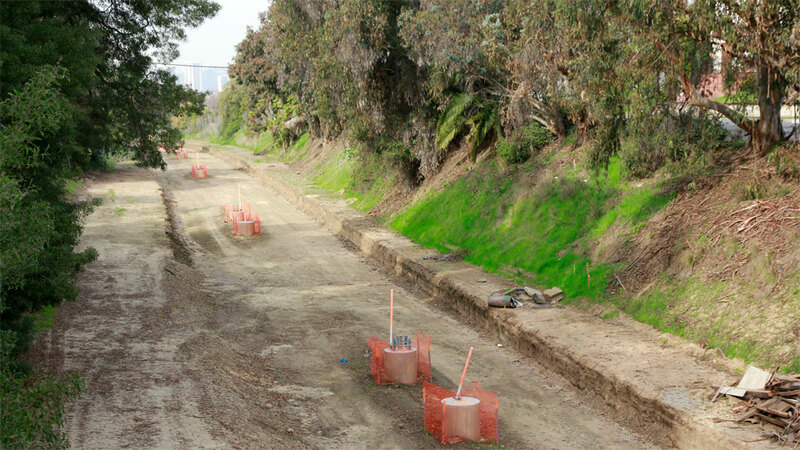 1/15/14 — The first ties are being positioned in the Northvale trench. 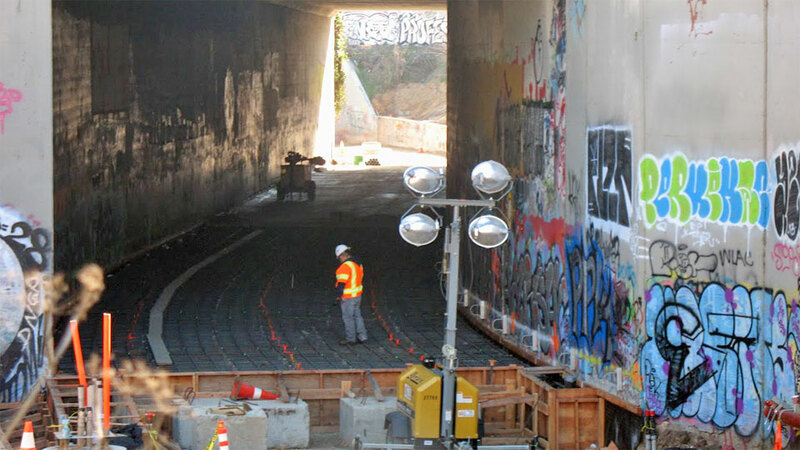 12/26/13 — Nice view south toward the tunnel under the I-10 freeway, awaiting tracks. 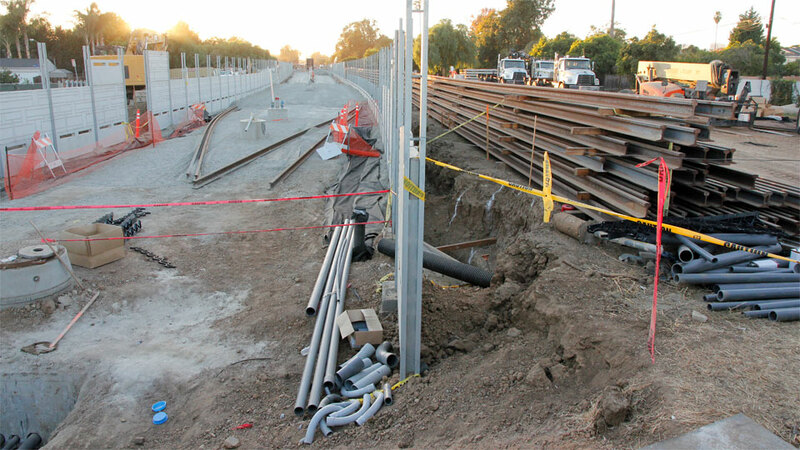 12/9/13 — Embedded track will hold the rails to close tolerances through the 25-foot-wide tunnel under the I-10 freeway, above. 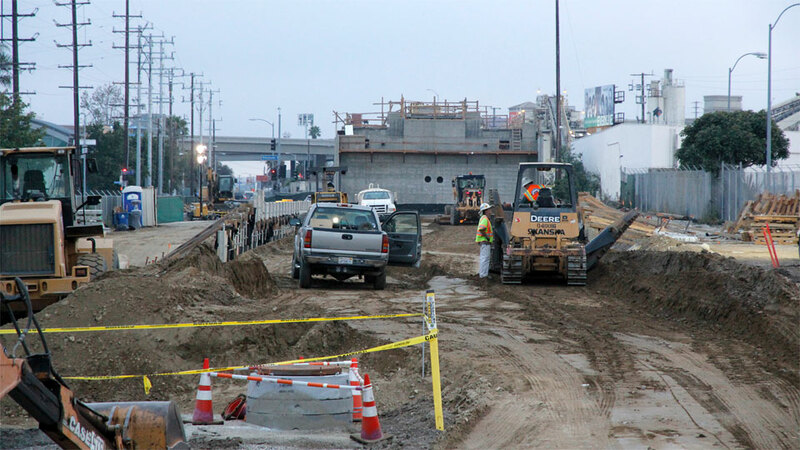 Below is another view of the right-of-way east of Overland Ave., looking south toward the pedestrian bridge. 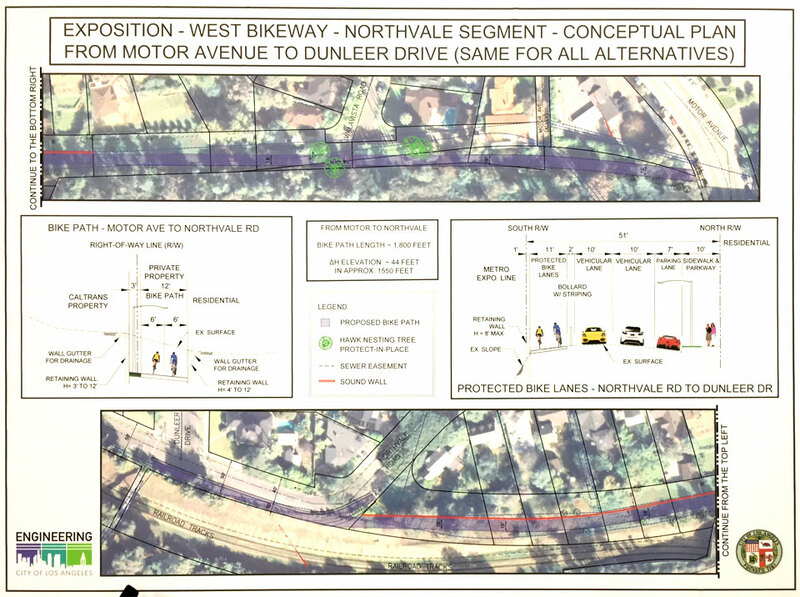 The restricted-use easement between the freeway and backyards south of Northvale (below) is getting closer to becoming part of the Expo bike path. 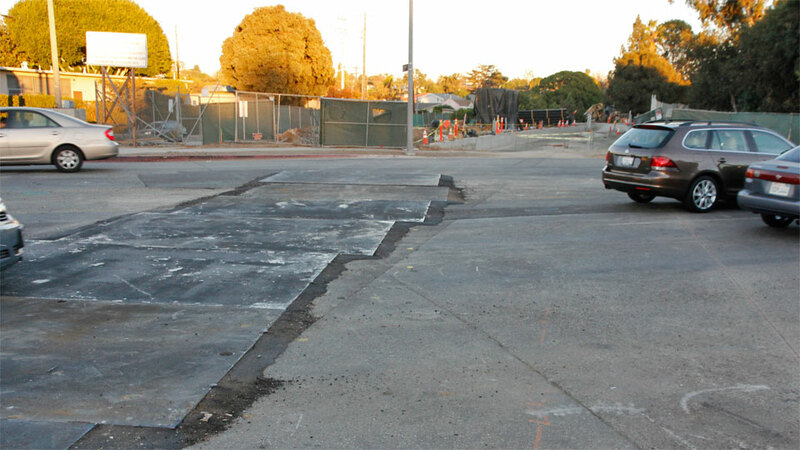 11/30/13 — The Overland Avenue crossing is complete. 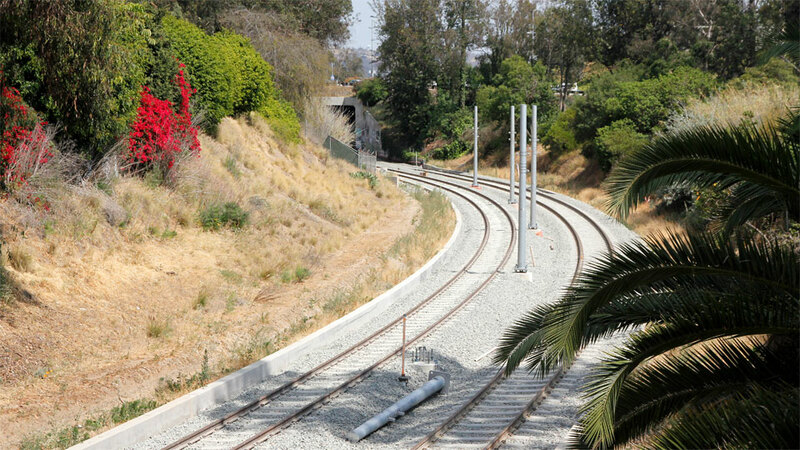 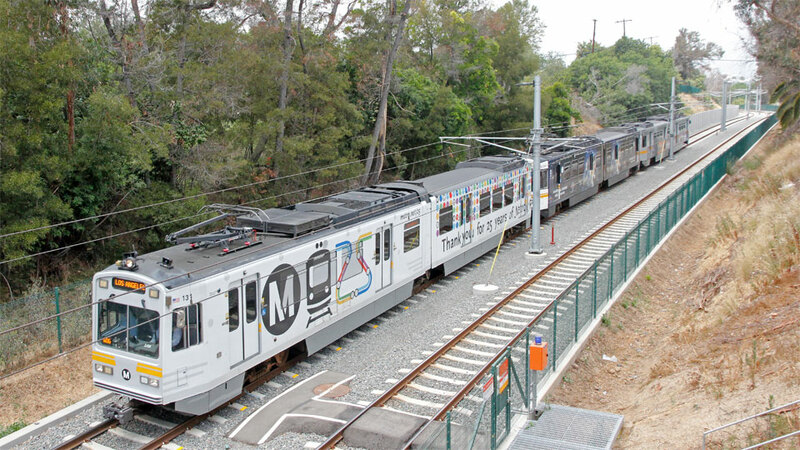 Imagine these rails going all the way west to Santa Monica (below) and east to downtown L.A. (following)! 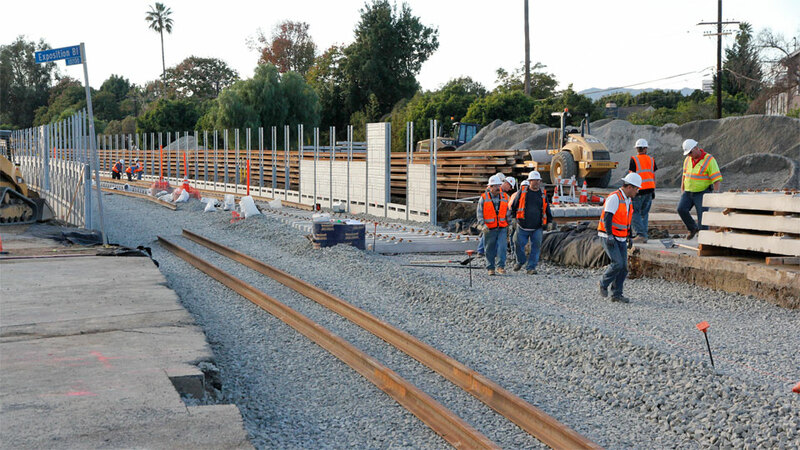 Track is yet to go along Northvale (above) or to Military, although we see special trackwork for the crossover east of Military (below). 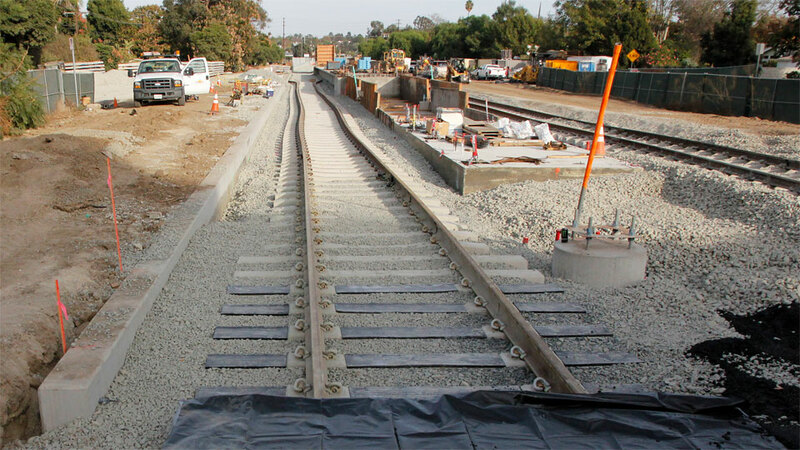 11/24/13 — The second track across Overland was installed (below) and paving completed Sunday evening (above). 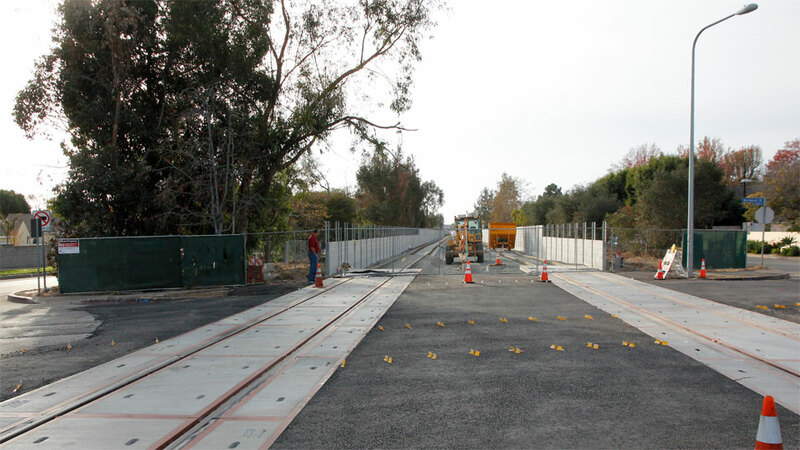 11/23/13 — Overland Avenue was closed for the weekend's construction (below) and the first track laid Saturday (above). 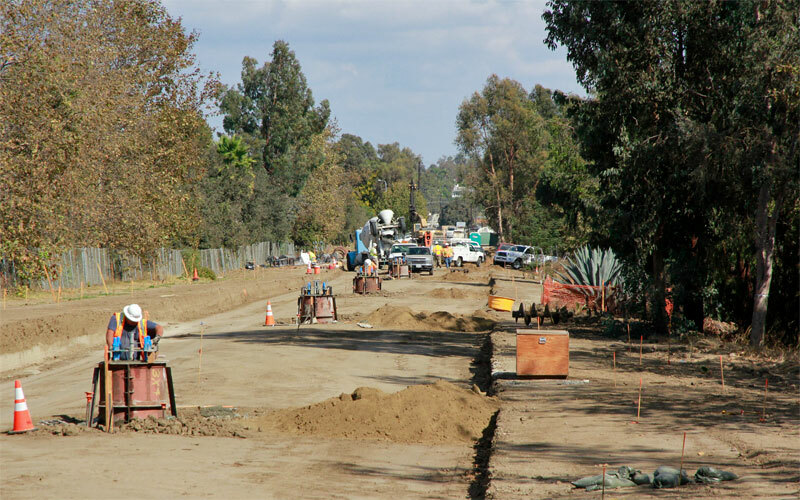 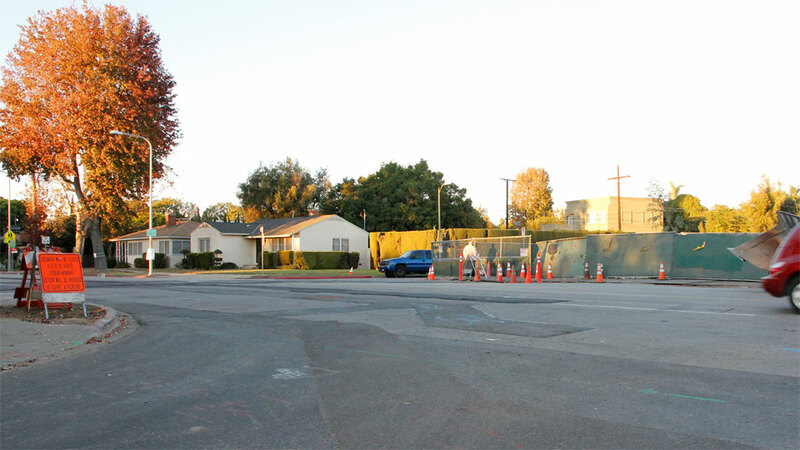 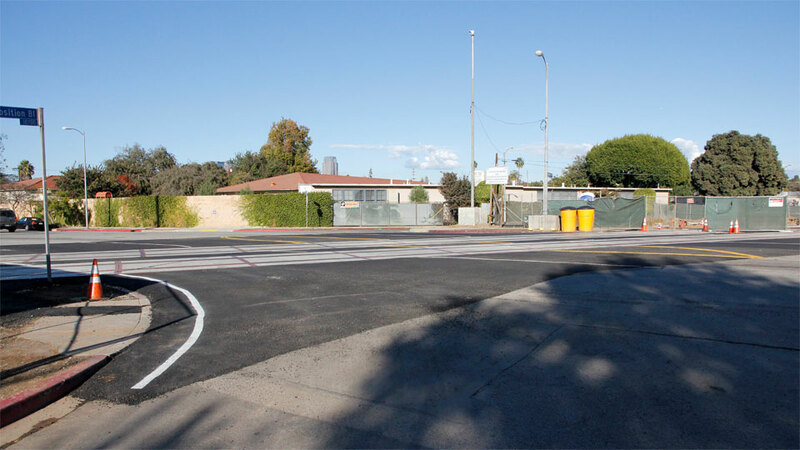 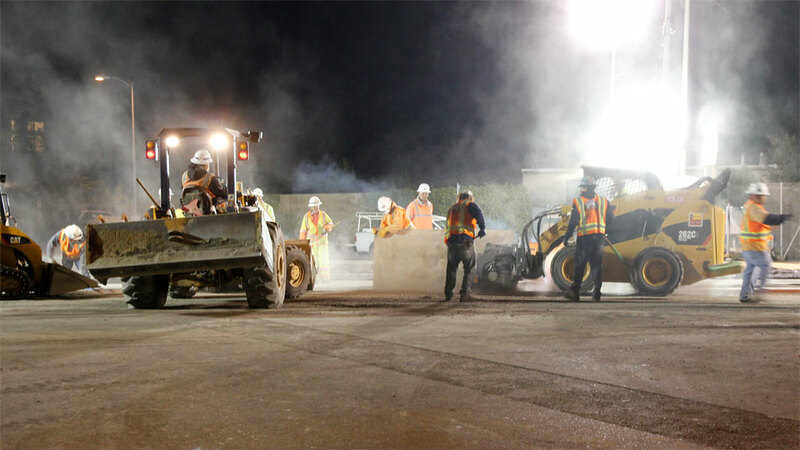 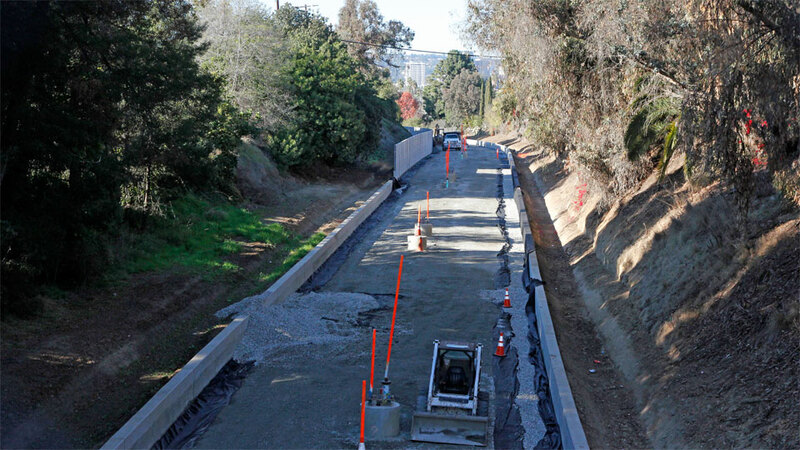 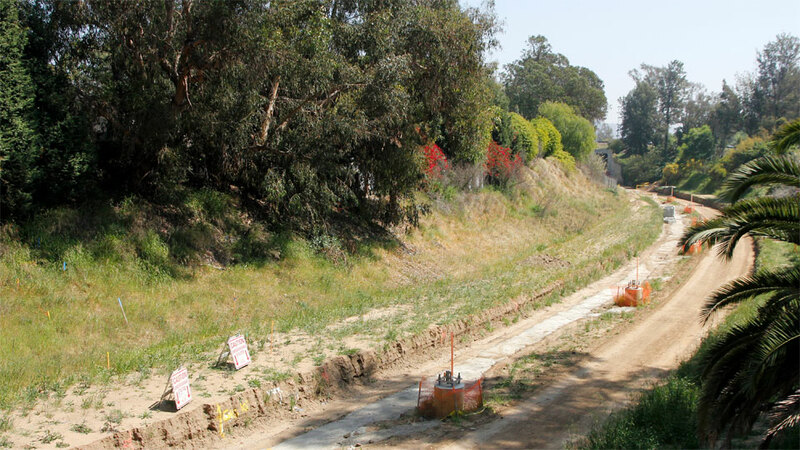 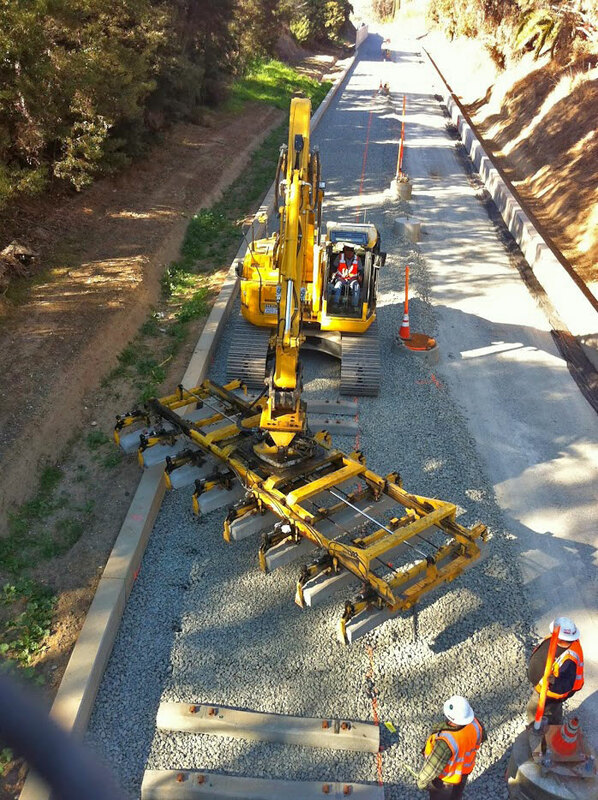 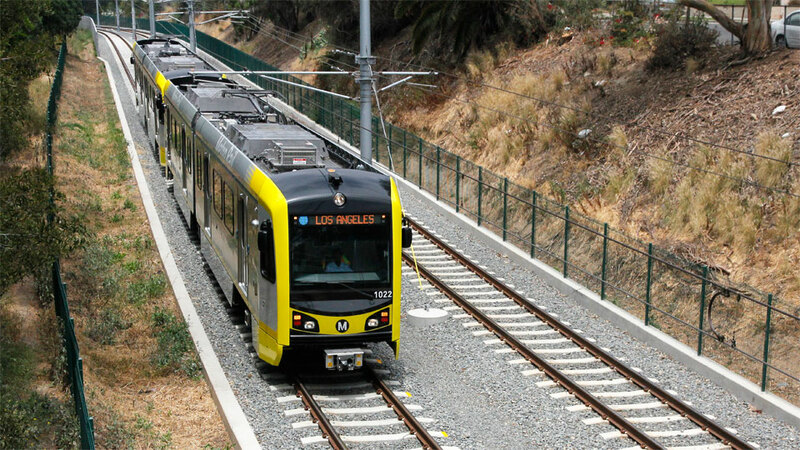 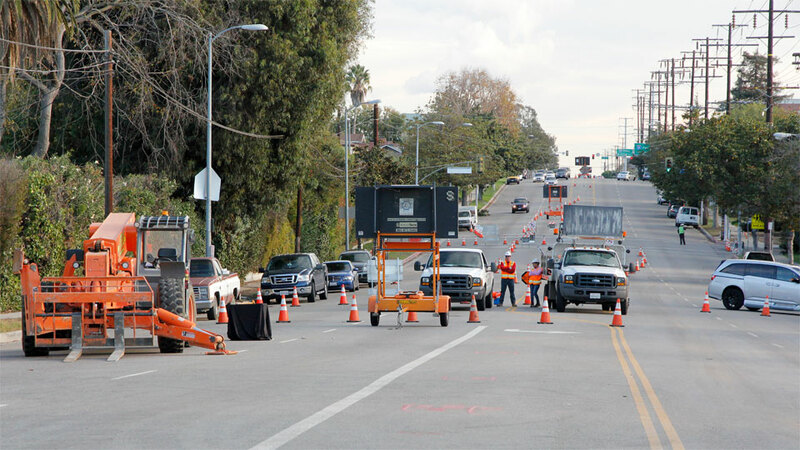 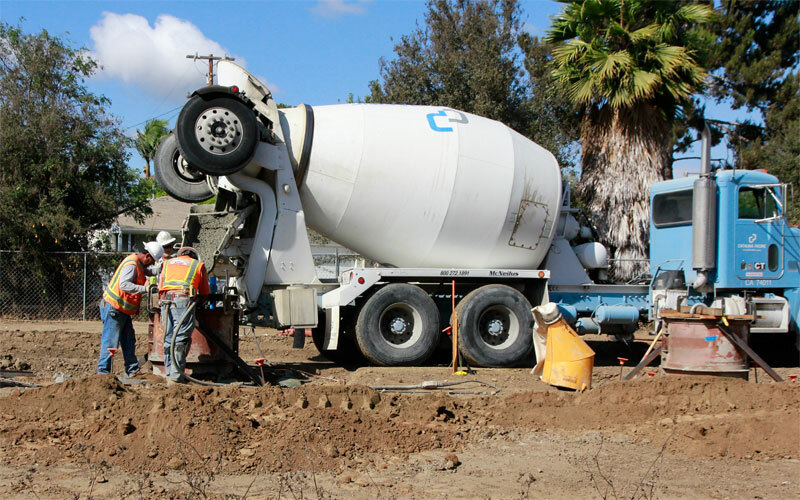 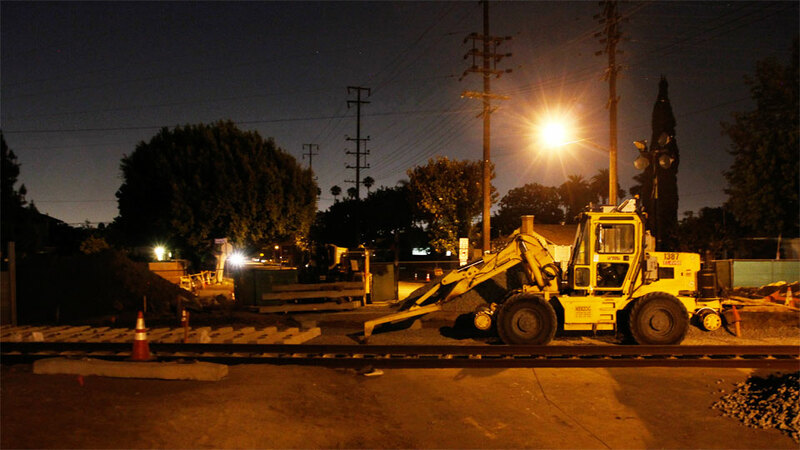 11/18/13 — The first phase 2 track was laid across Westwood Blvd. 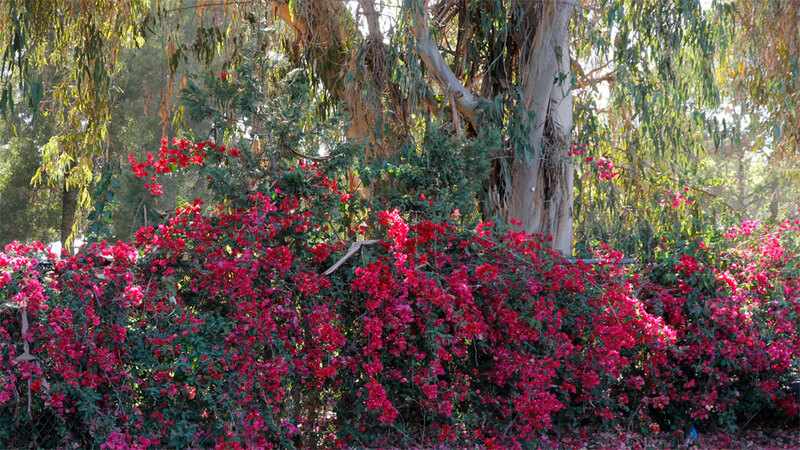 this weekend! 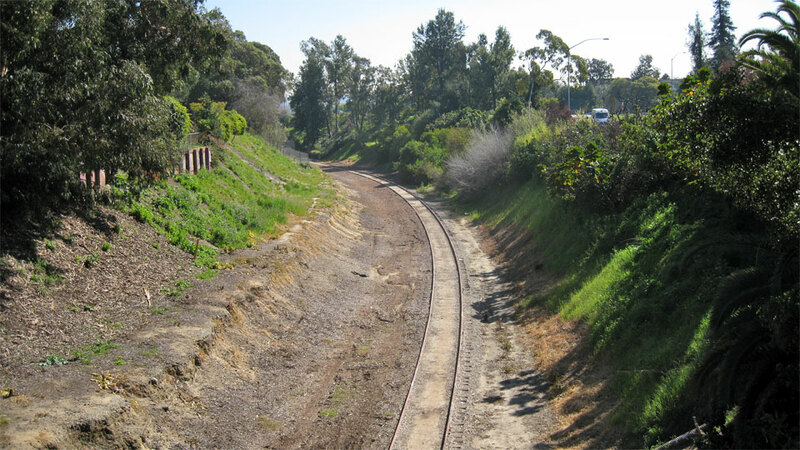 Looking north (above), west (below), and east past the Westwood station (bottom). 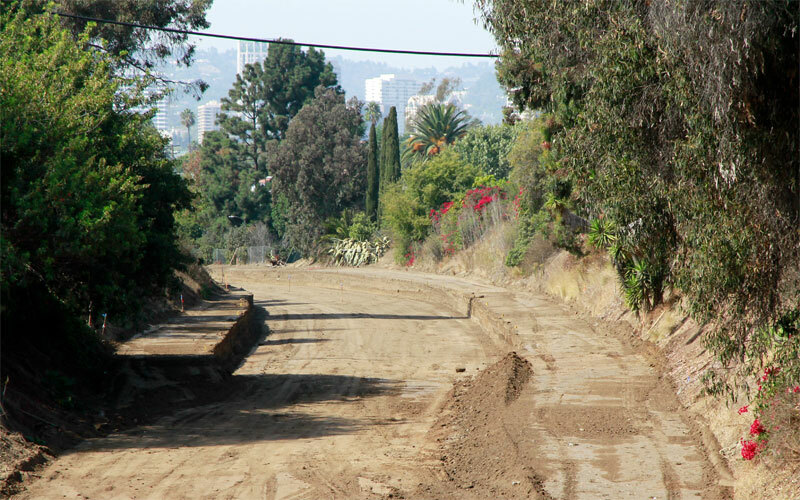 11/14/13 — View of Westwood Blvd. 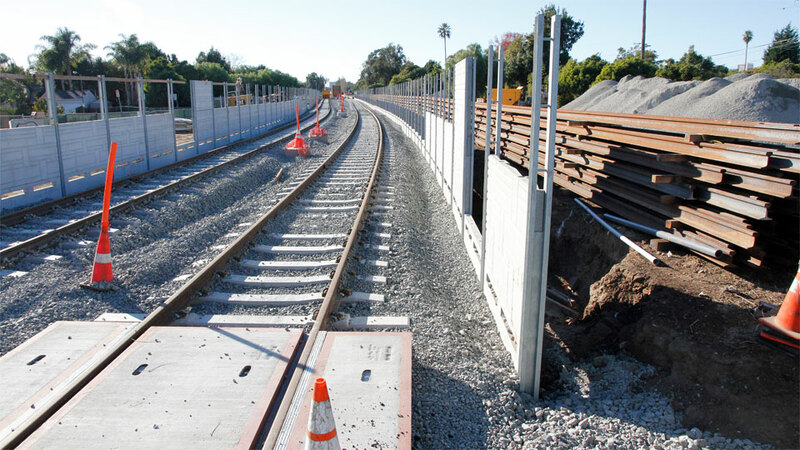 crossing just before tracks are installed (above) and at Overland Ave. showing rails and duct bank, and (following). 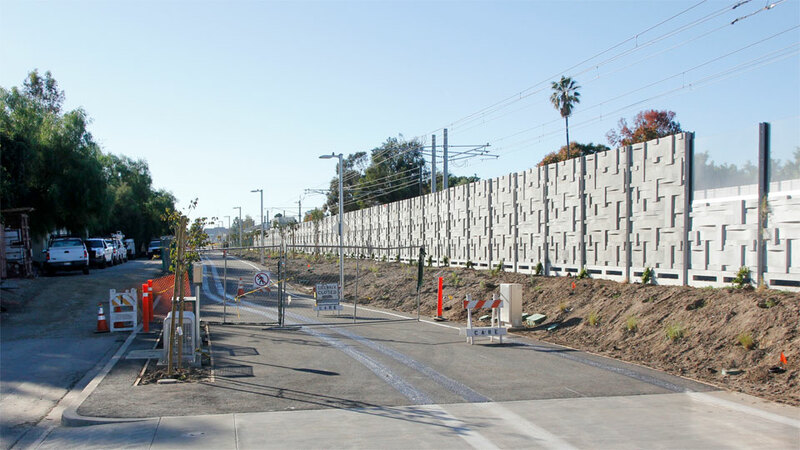 9/18/13 — Views west from Military Ave. showing sub-ballast and sound walls. 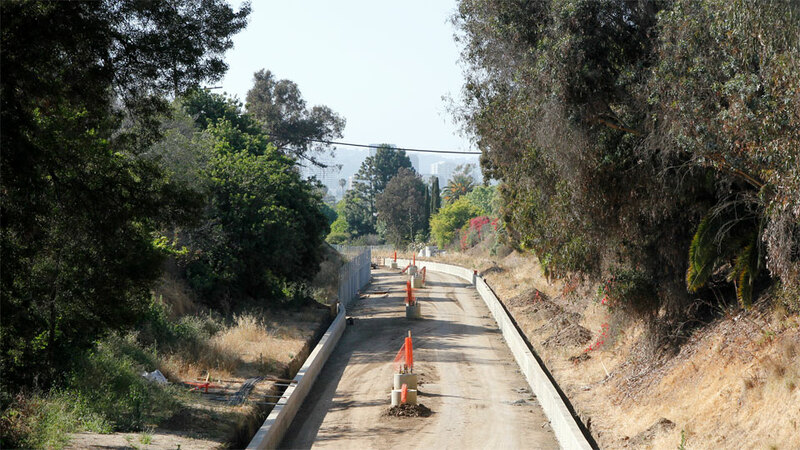 5/30/13 — Looking east from Overland the soundwall posts and substation conduit lead into the Northvale trench curve between great mature trees (above). 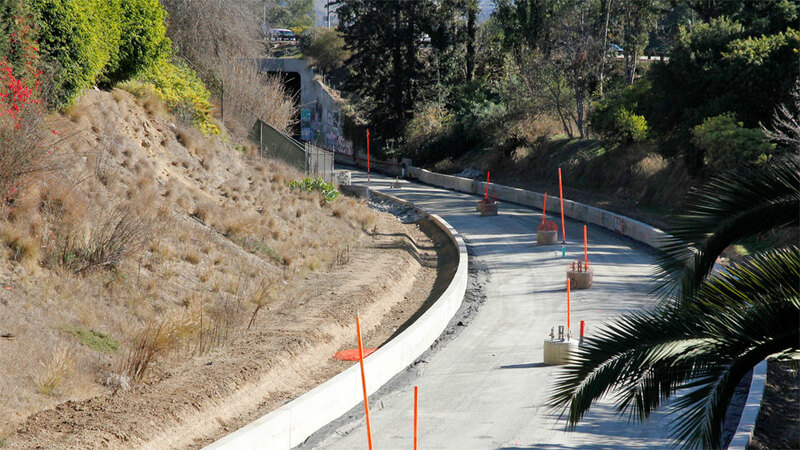 From the other direction (below) ballast curbs are complete in the trench. 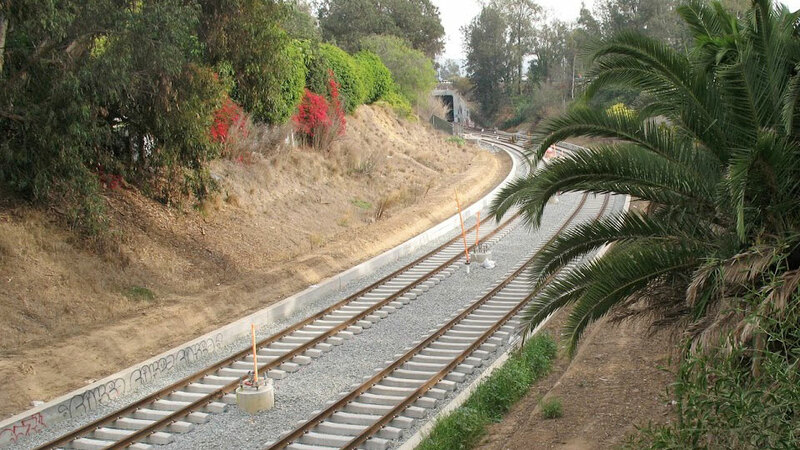 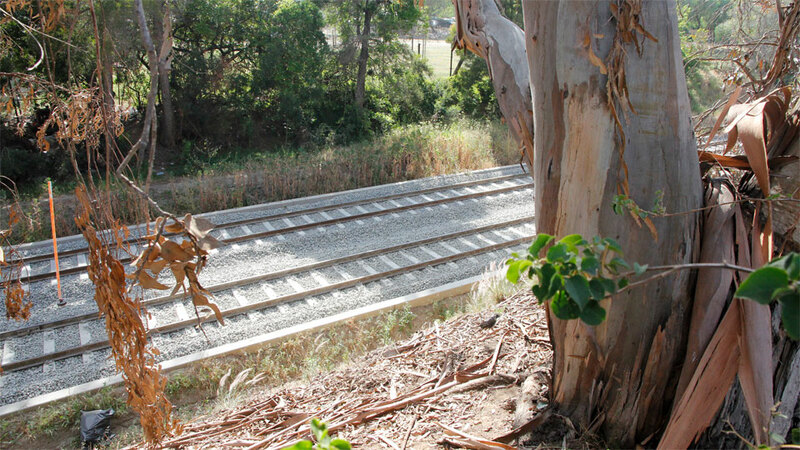 One can imagine the double tracks curving toward the freeway (above), passing the vivid bougainvilleas and shaggy eucalyptus along Northvale (below). 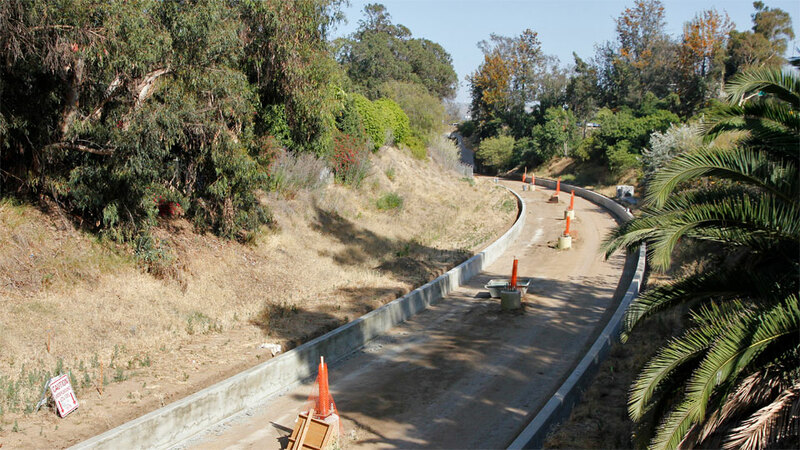 5/1/13 — Sound wall supports are in place along the north-west side of the woodsy Northvale trench (above), and ballast curbs are along the south-east side toward the freeway tunnel (below). 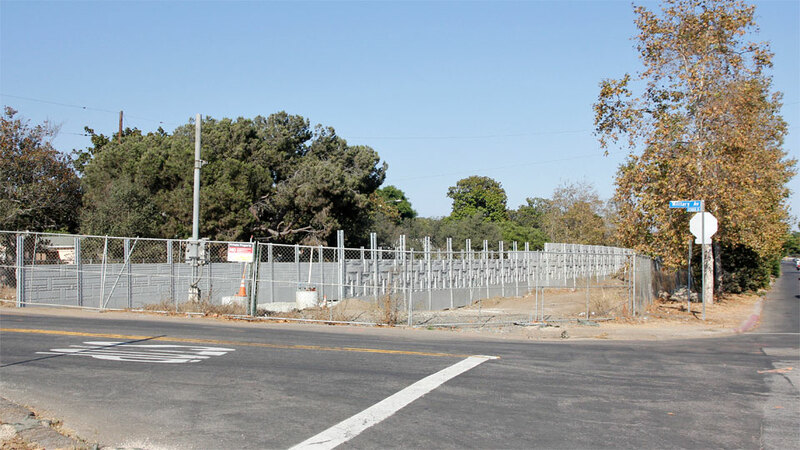 4/1/13 — Conduits beginning the substation east of Overland Ave. are in place, and contrast with the wild-looking trees on the right. 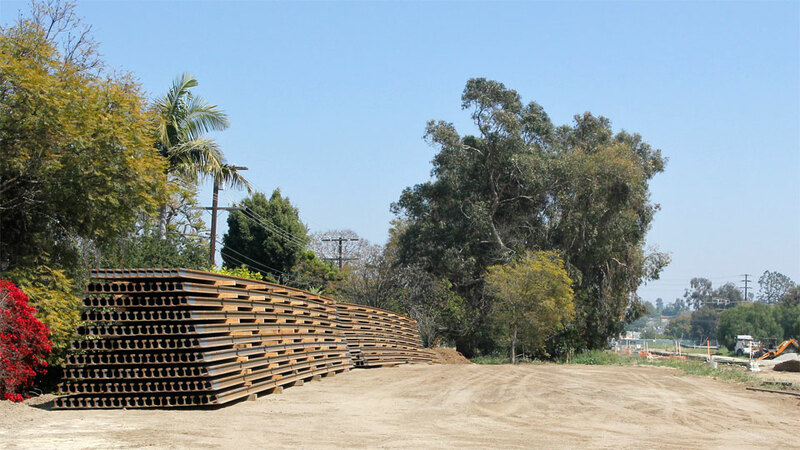 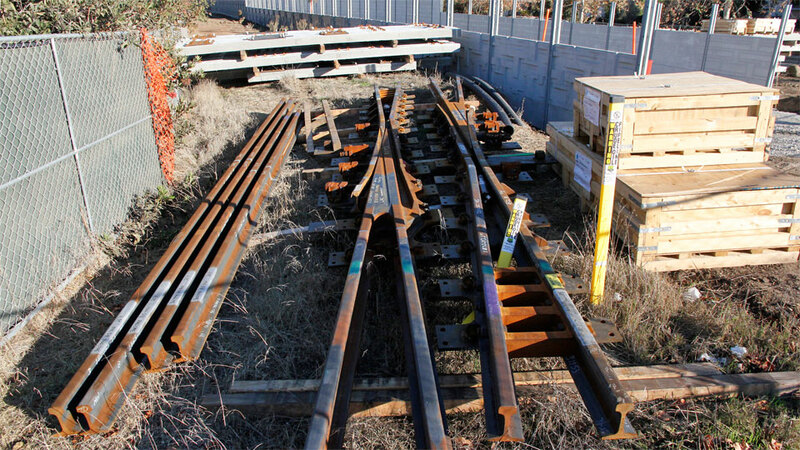 3/24/13 — Rails have arrived, stacked east of Westwood Blvd. 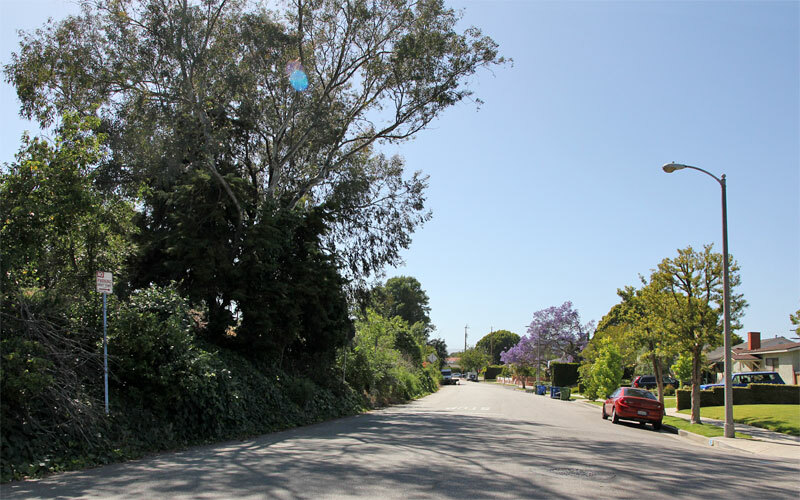 (above)! 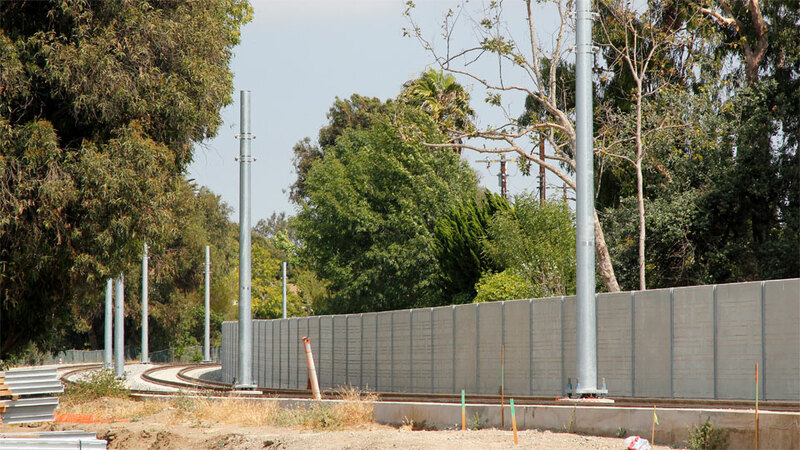 Soundwall posts are in place east of Military Ave. (below). 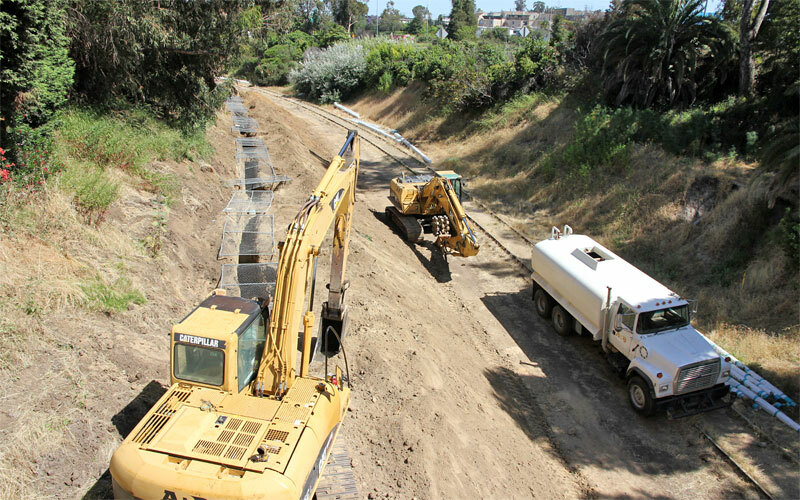 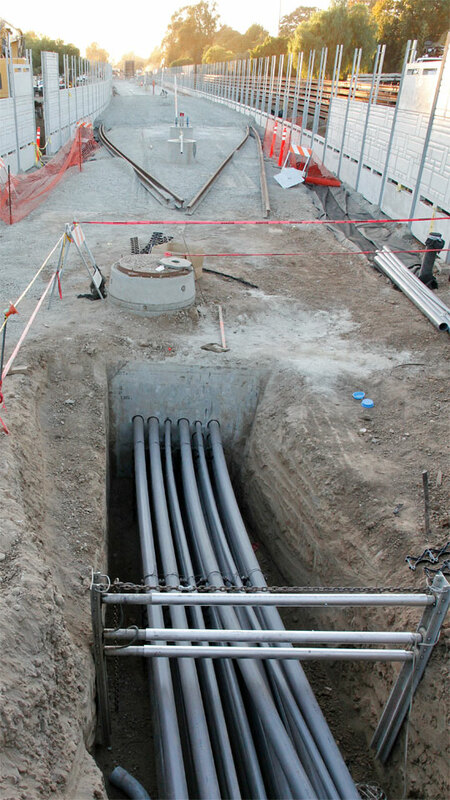 Ductbank conduits are visible below the slurry filling their trench (above), which continues toward the freeway (below). 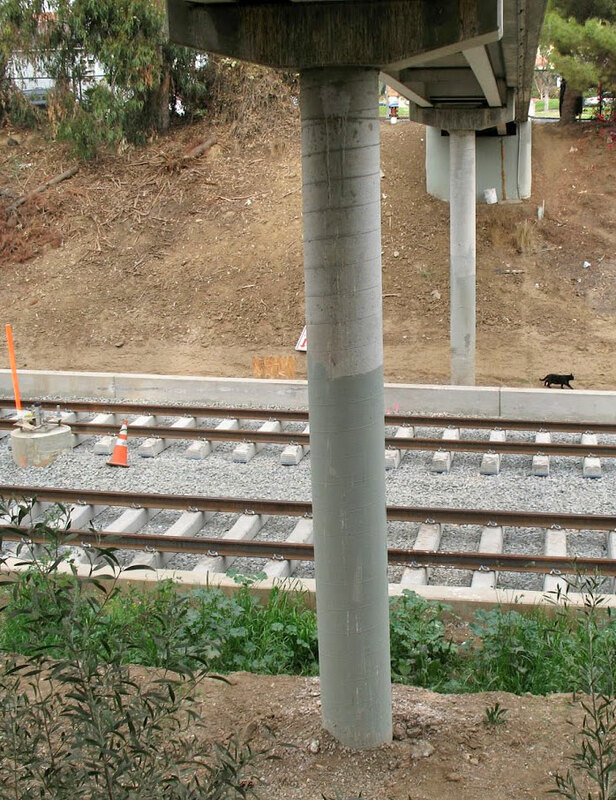 1/9/13 — OCS pole footings are ready past Cheviot Hills, looking south (above) and north (below) from the Palms Park bridge. 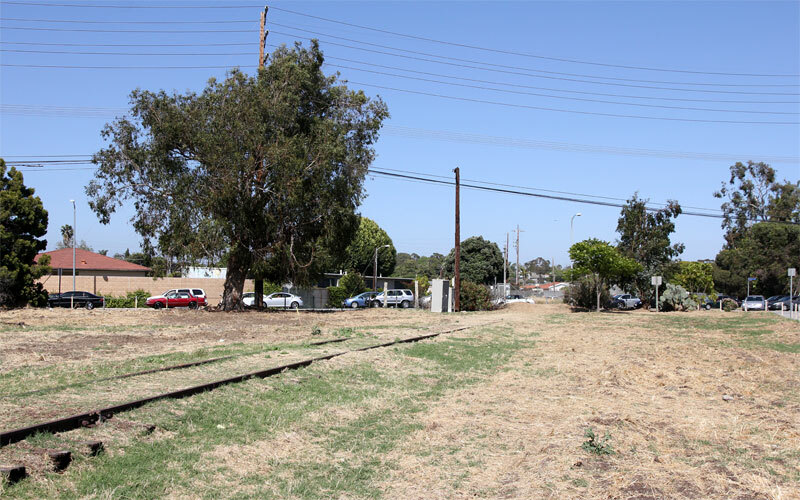 12/10/12 — The winter grass shone bright green next to the excavated right-of-way, seen from Selby Ave., west of Overland. 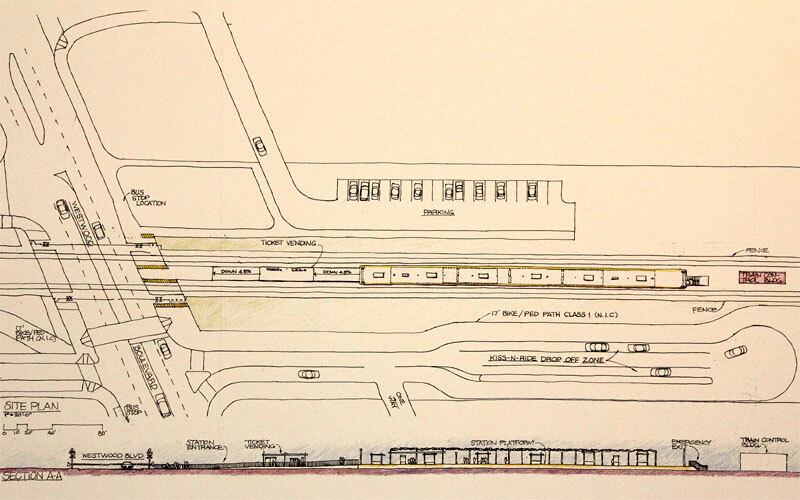 10/15/12 — Detailed plan of the Westwood Boulevard station. 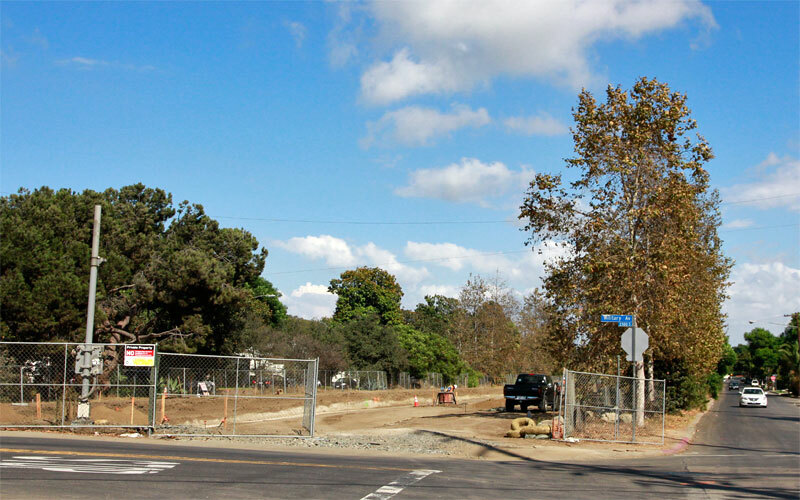 10/10/12 — It was a lovely fall day — with leaves turning and puffy clouds — to photograph the rapid progress on OCS (catenary) pole bases being poured from Military to Westwood. 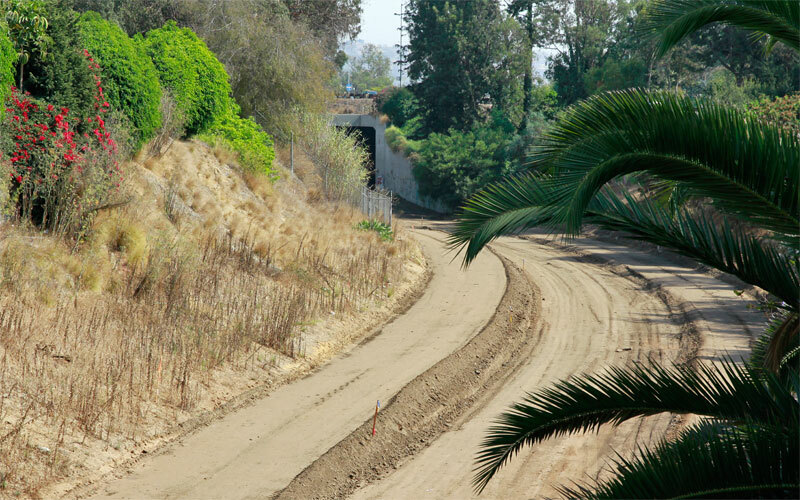 7/10/12 — The trench by Northvale has been partly filled to minimize need for retaining walls, looking southeast from the Palms Park pedestrian bridge toward the I-10 tunnel (above and zoom below). 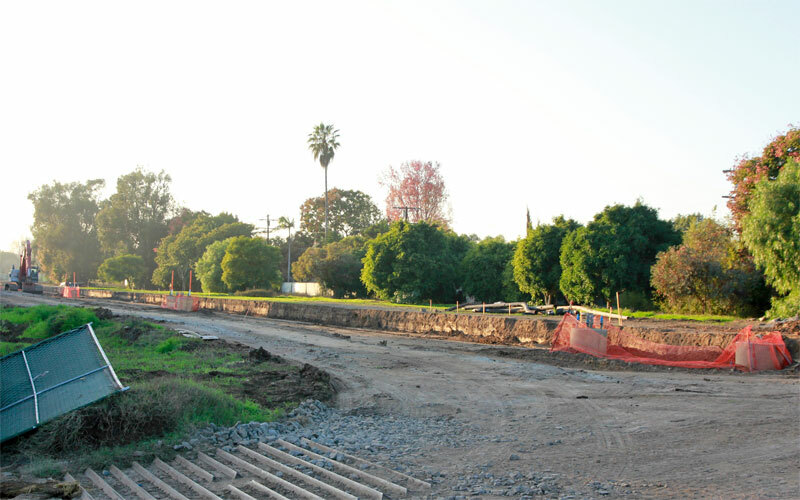 Looking northwest, grading has begun for the tracks' ballast. 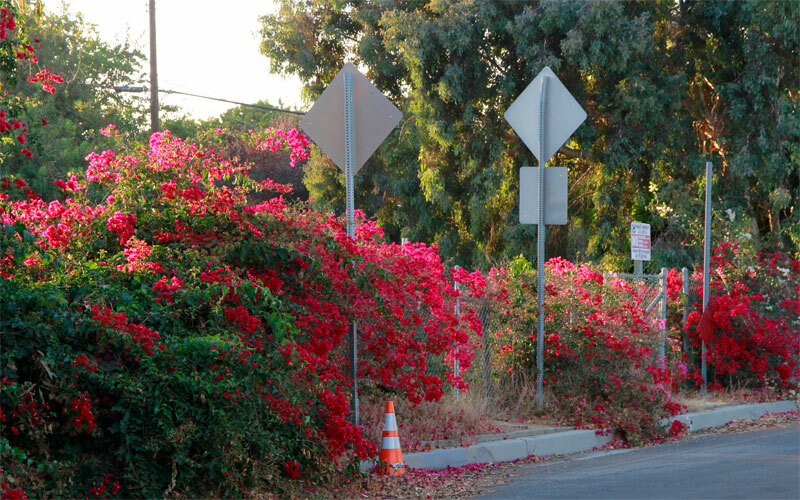 9/17/12 — And a lovely backlit bougainvillea on Northvale. 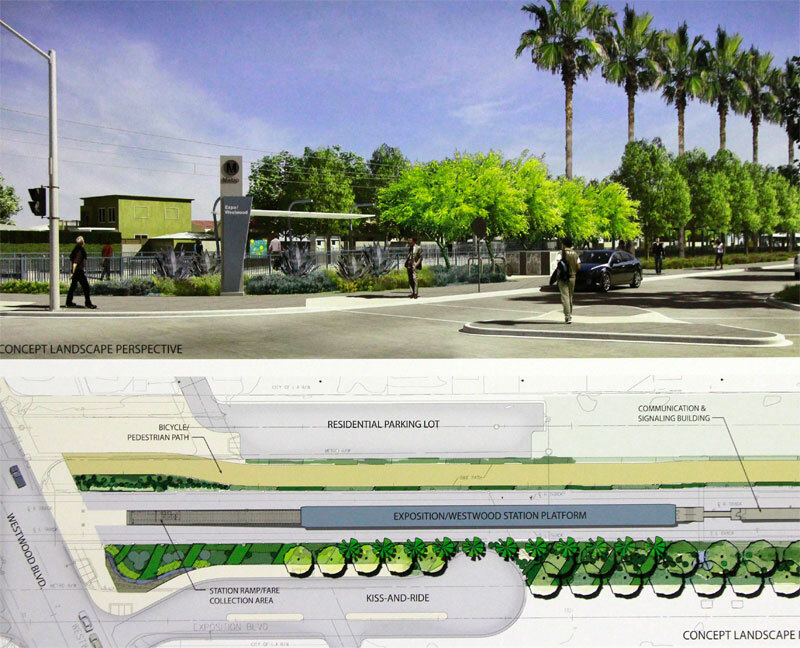 7/10/12 — Tonight's Expo Authority - Skanska/Rados Phase 2 community meeting featured posters of these new renderings of the Westwood station. 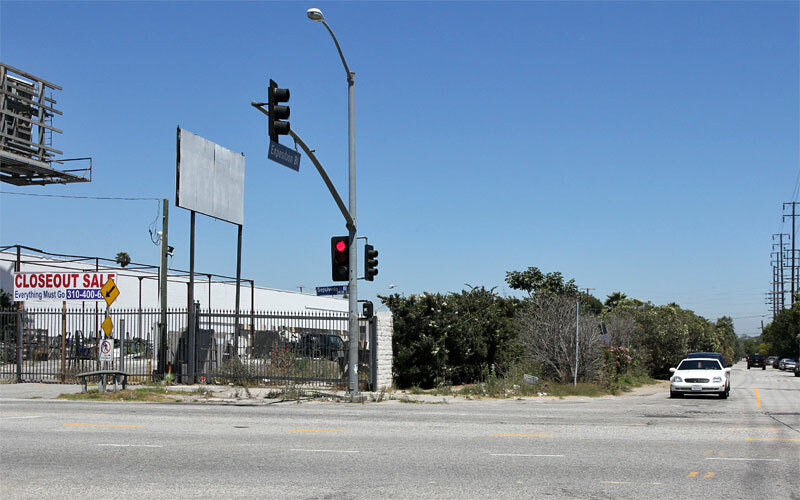 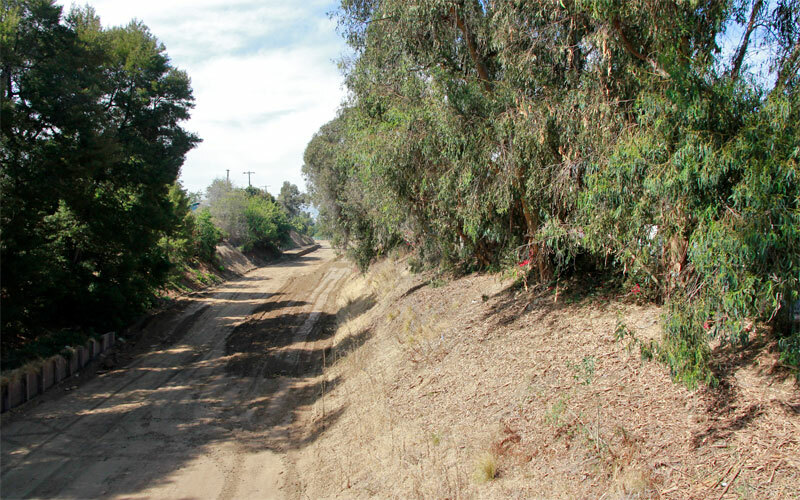 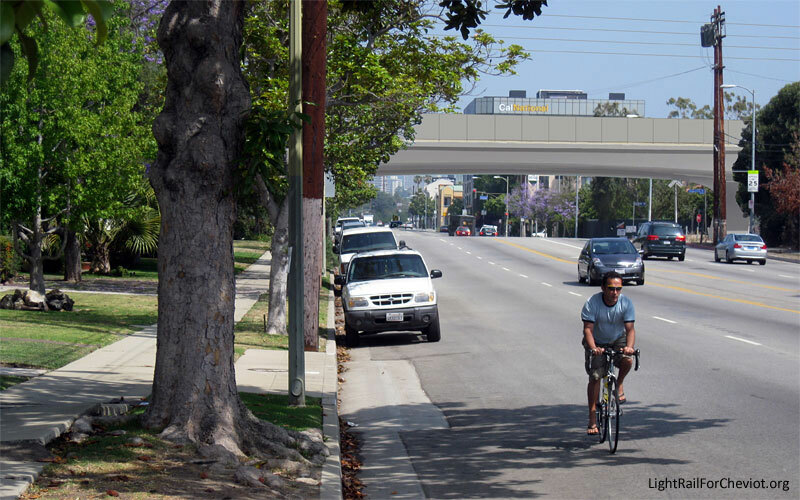 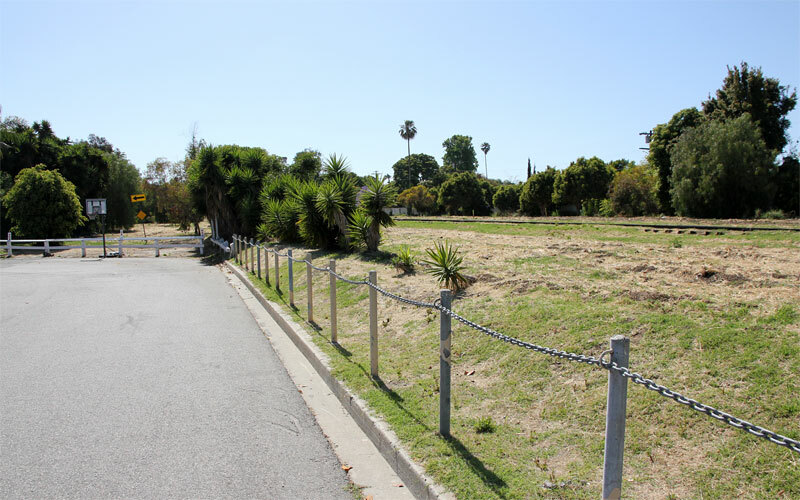 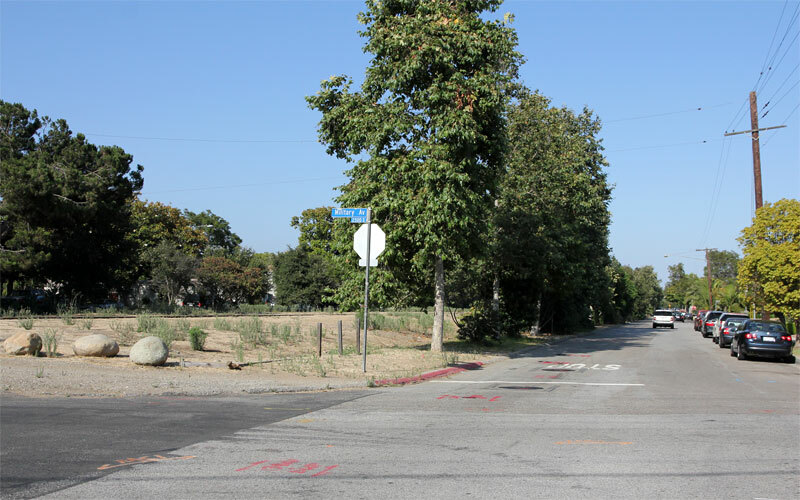 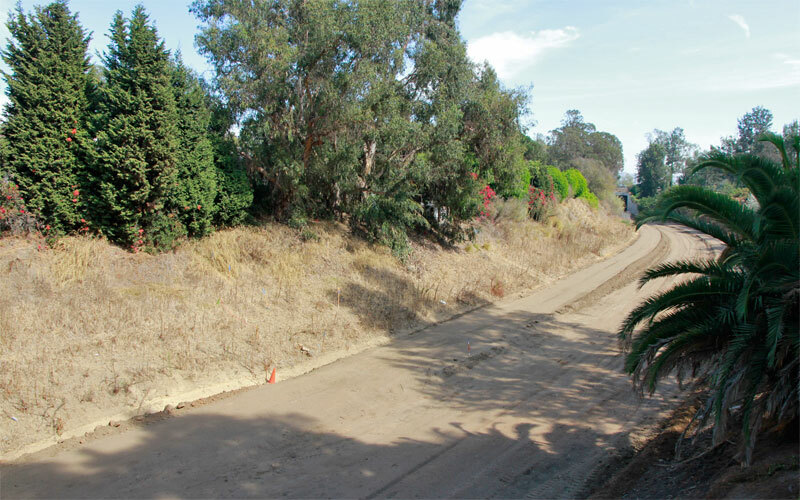 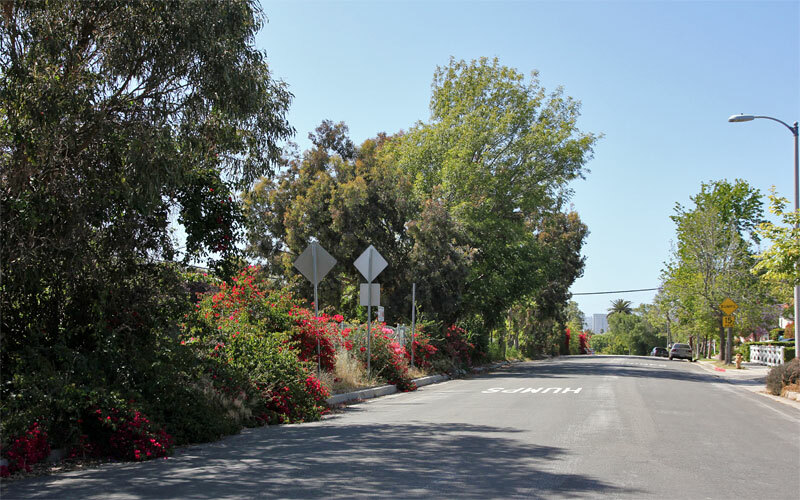 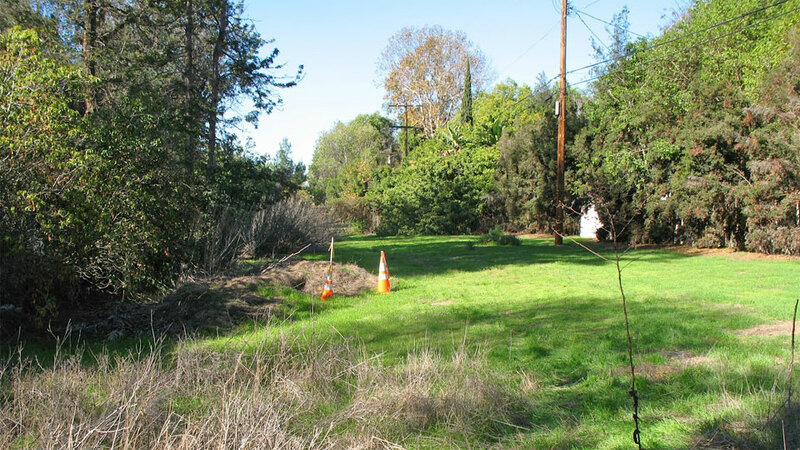 Here is a series of "before" photos to remember how it used to look on on the right-of-way from Sepulveda Boulevard to I-10. 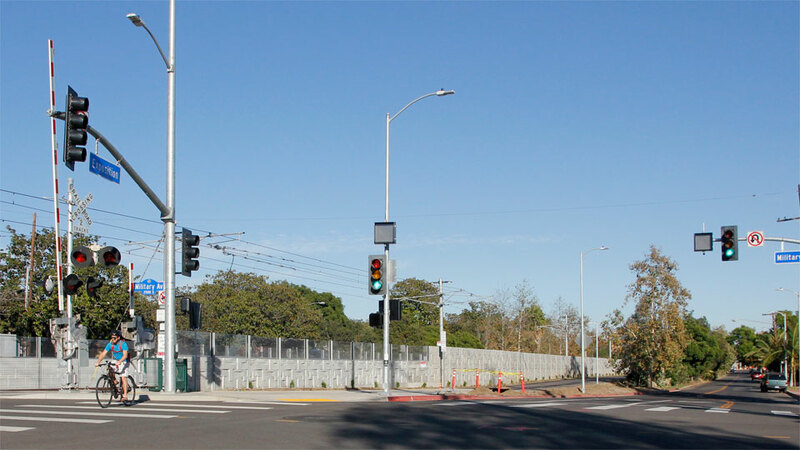 5/9/11 — Tonight's Expo Authority - Skanska/Rados Phase 2 community meeting featured a poster of this "site concept" image of the Westwood station. 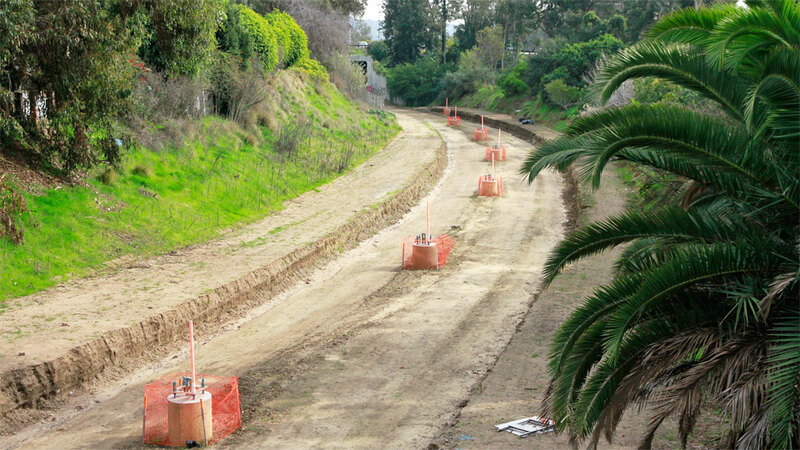 2/7/08 — "Before" views from the pedestrian bridge south toward the freeway (above) and north toward Westwood (below). 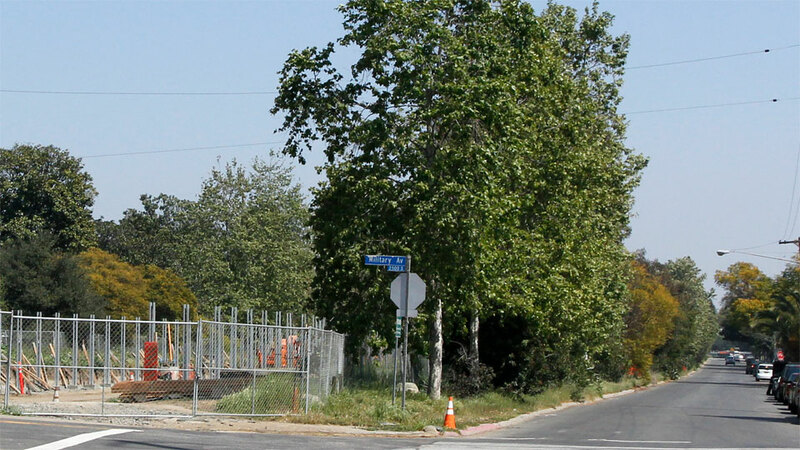 3/5/07 — A station would be on the east side of Westwood Blvd., a major bus corridor. 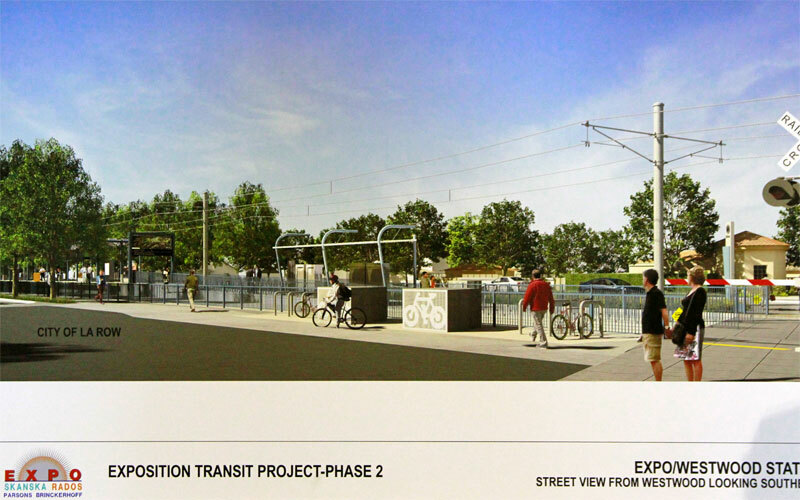 This is projected to have has the greatest projected boardings (5,213) of all phase 2 stations. 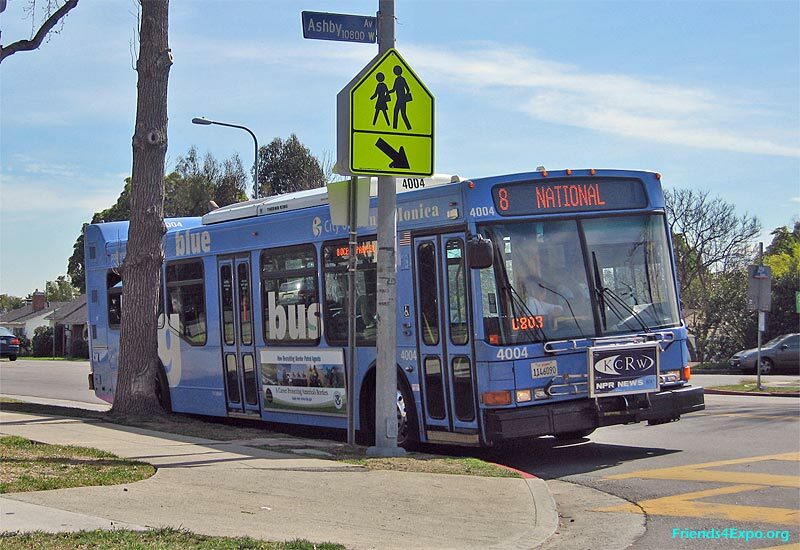 Santa Monica's Big Blue Bus #8 (National-Ocean Park  left) and #12 (Palms) lines connect to Westwood and UCLA. 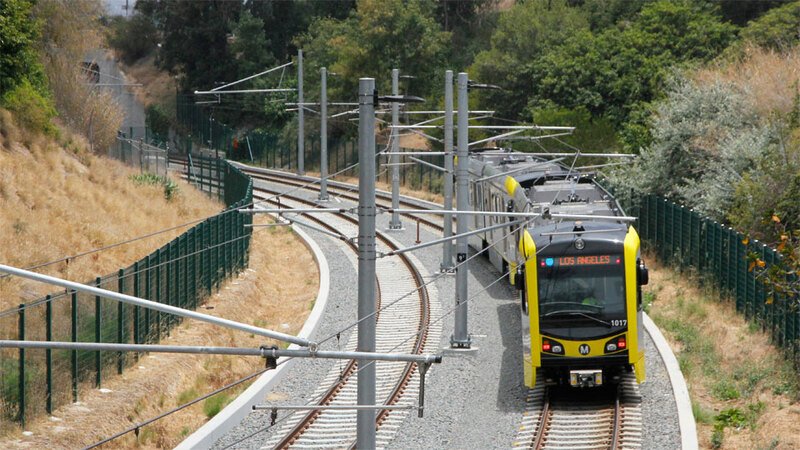 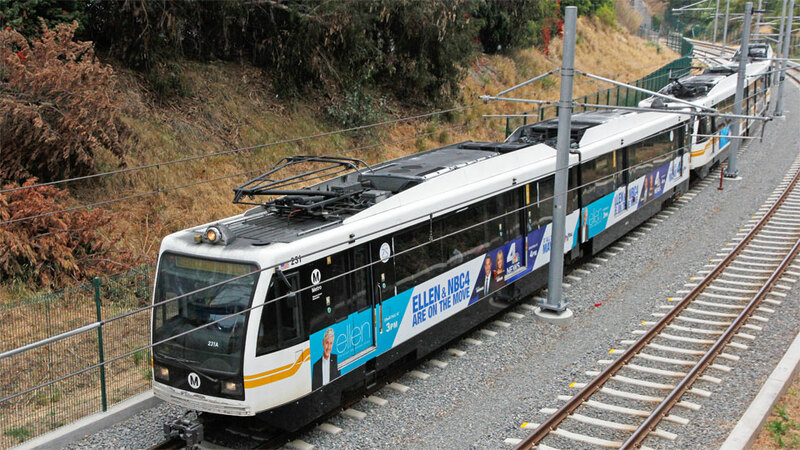 Culver City's #3 line from Fox Hills and Culver City connects to Century City. 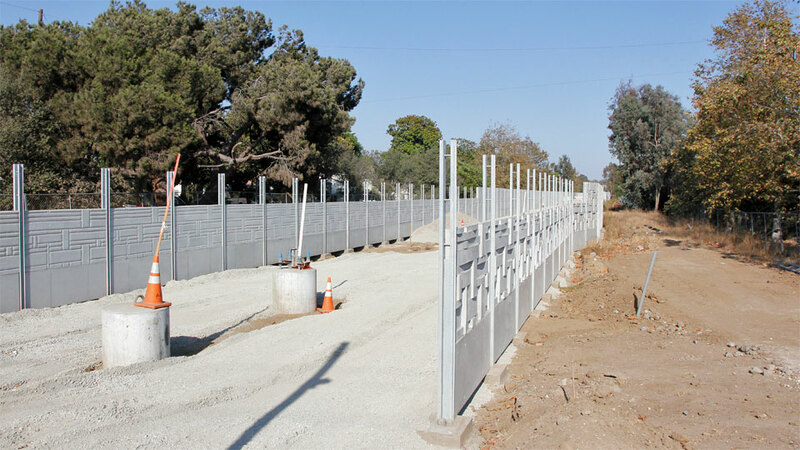 The section from Overland to Westwood is 200 feet wide between back fences. 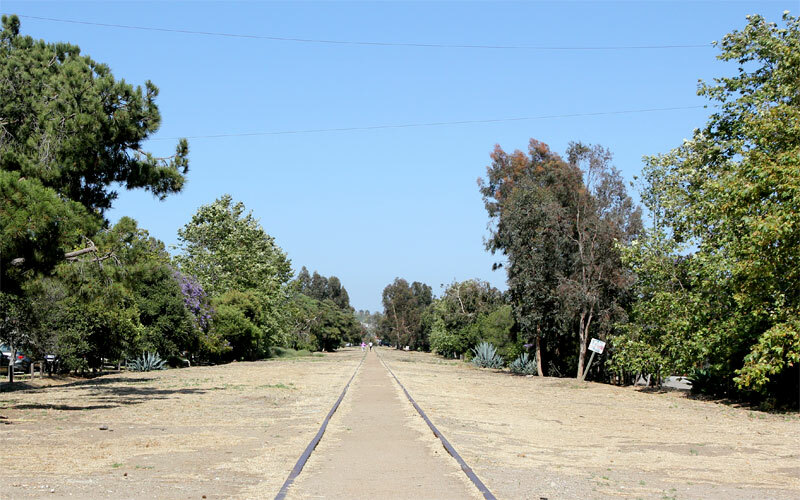 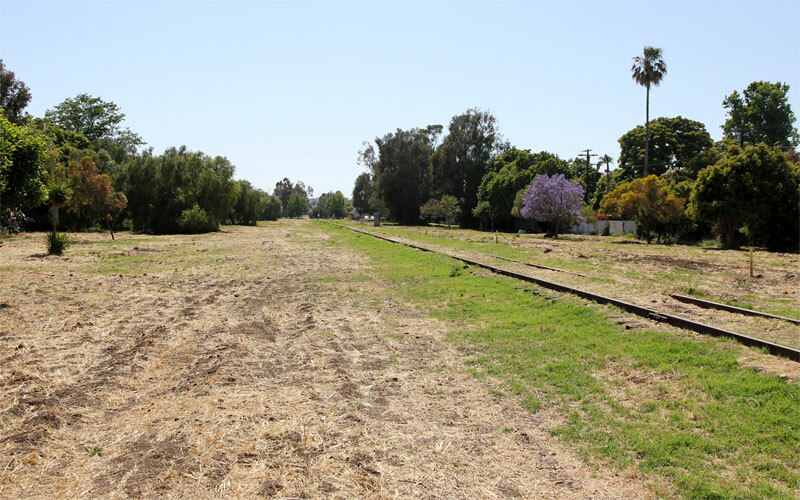 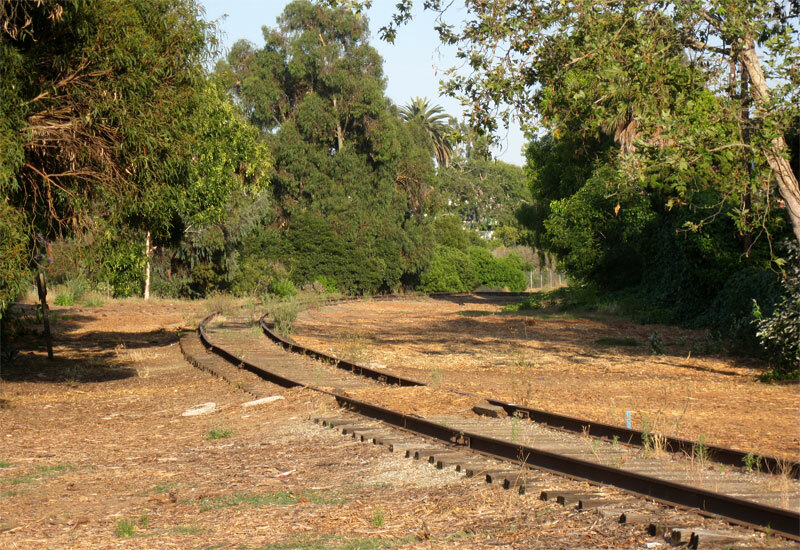 We support the Green Corridor concept for a simulated stream bed and neighborhood park alongside the tracks here, instead of a surface parking lot. 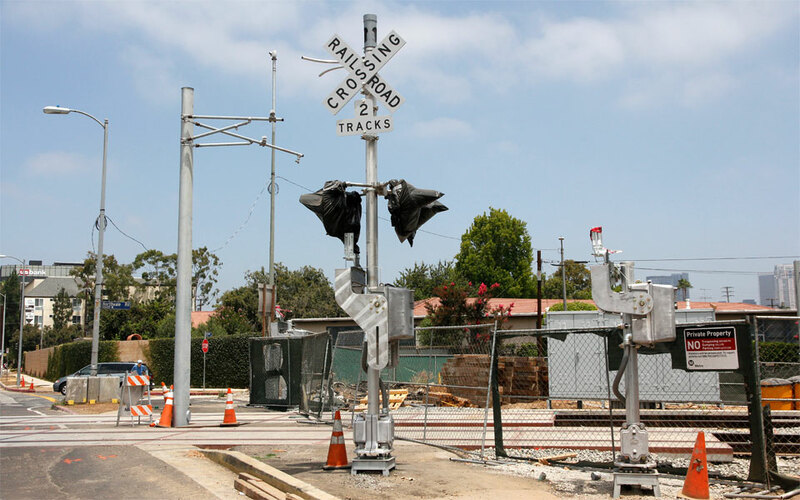 An at-grade crossing was adopted for Overland, with traffic mitigated by adding a third lane in each direction between Coventry and Cushdon. 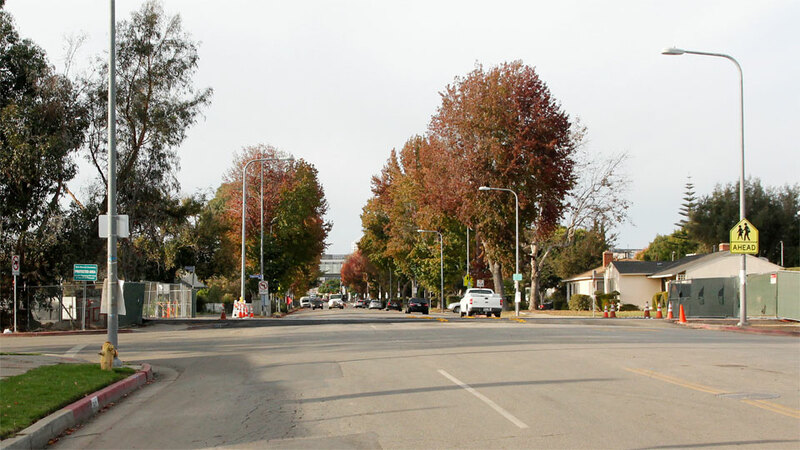 Keeping parking on one side will remove the parkway and street trees between Cusdon and Coventry unless the traffic lanes can be slightly narrowed (10' to 9.5'). 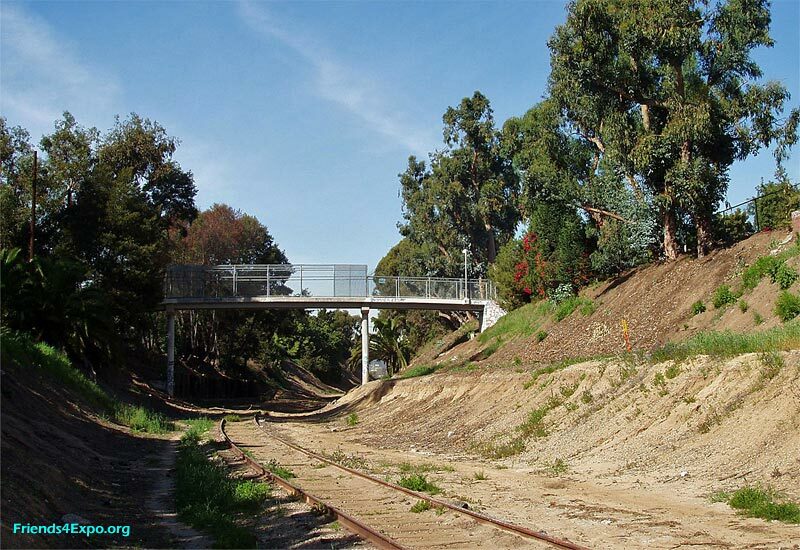 This image shows what a bridge there might have looked like. 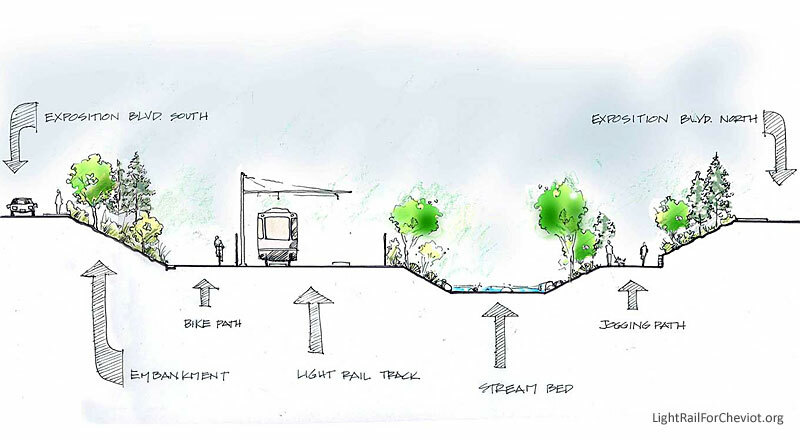 An underpass below the Overland and Rountree storm drains would be as long as the Flower-Figueroa underpass but over twice as deep (55 feet deep vs. 25, unprecedented and clearly not practicable. 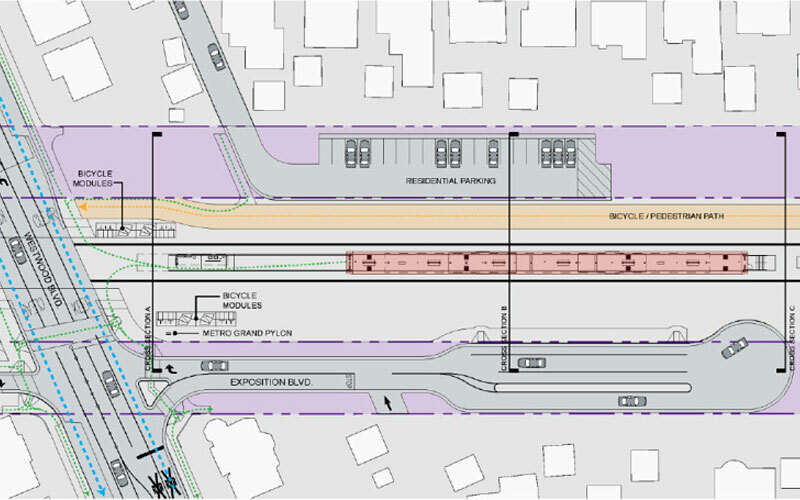 An underpass below Overland and Westwood, with station, was estimated to cost $224 million additional and cause significant construction impacts (2/4/10 agenda, item 6.a, page 8). 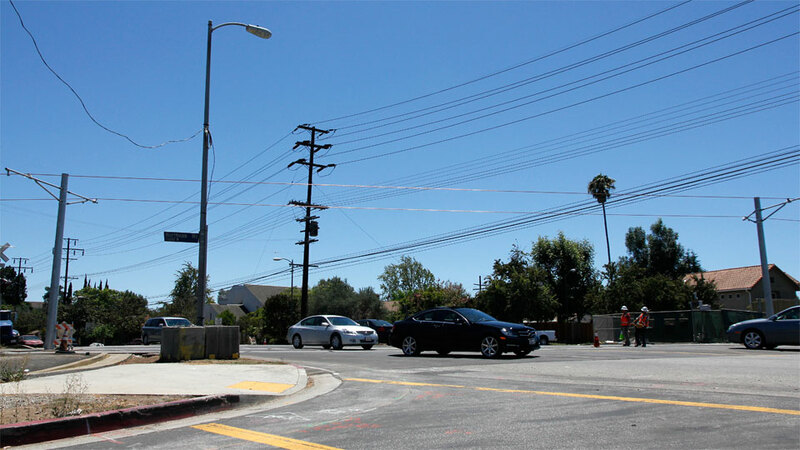 6/15/08 — View east of Overland late afternoon. 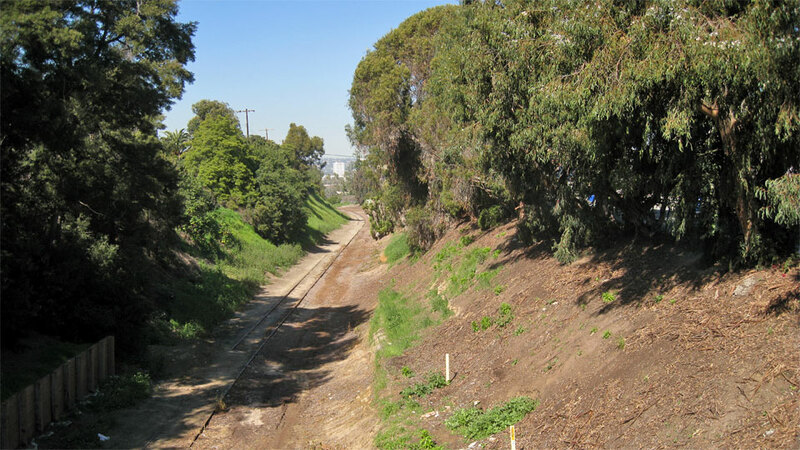 1/31/03 — After passing through the tunnel under the freeway, the 100-foot-wide right-of-way is in this trench on the south-west edge of Cheviot Hills (to the right). 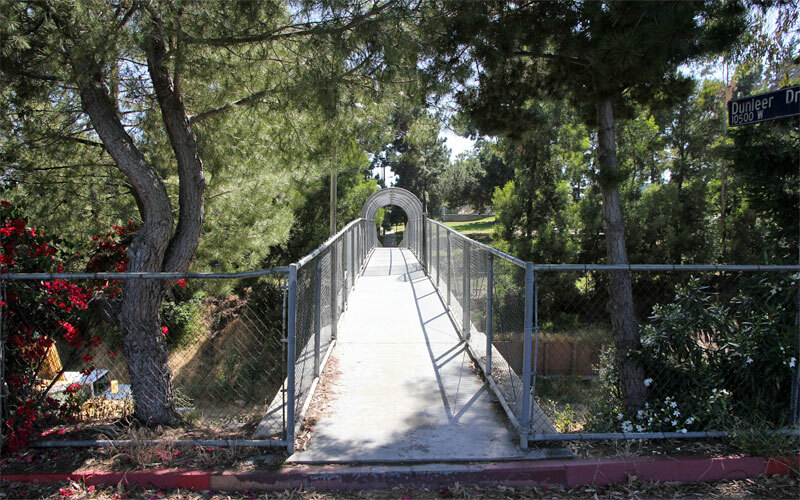 The pedestrian bridge to Palms Park (on the left) will remain (or be replaced if structurally necessary). 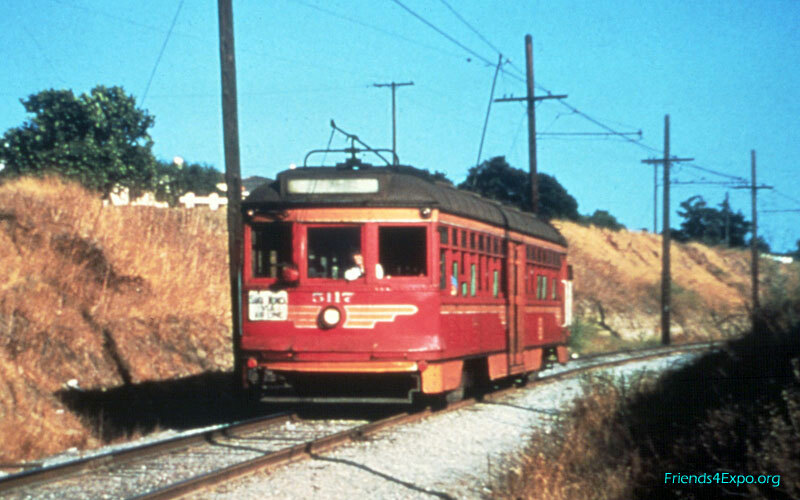 c. 1953 — An old Air Line Red Car passes through the trench by Cheviot Hills.